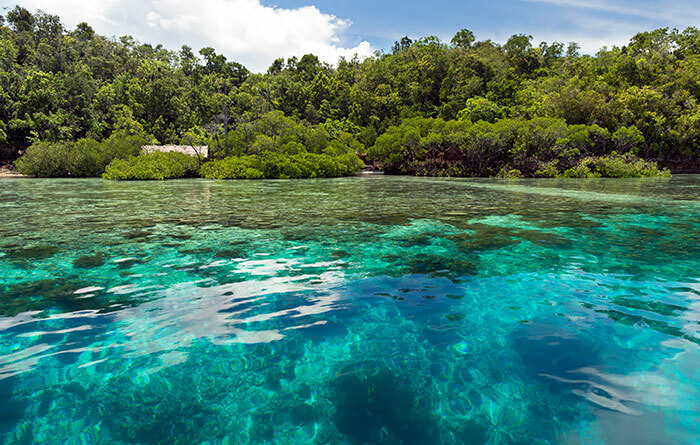 A verdant jungle setting, the marine wonderland of Pulau Gam’s south shore, and a dive center managed by one of Raja Ampat’s most experienced dive guides. Located just east of the village of Sawinggrai on Gam, Daroyen Village has two VIP bungalows with ensuite bathrooms and five private bungalows that share separate bathroom facilities. 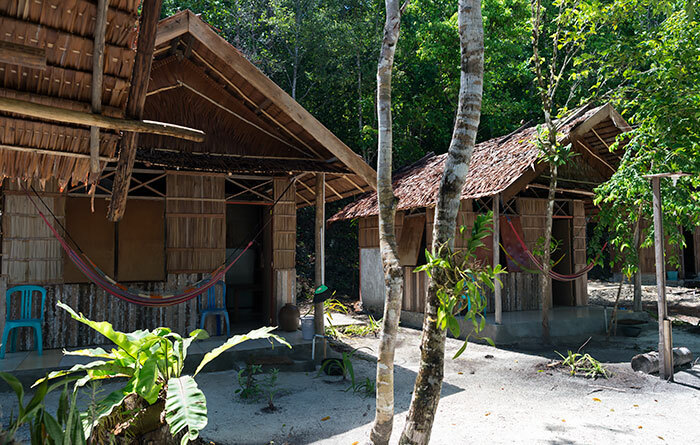 Four of the private bungalows are located on a narrow strip of beach that lies between the Gam jungle and coastal mangroves. A fifth private bungalow and the two VIP ones with ensuite bathrooms are located nearby on land. Each bungalow room sleeps two (twin or double). The VIP bungalows have raised beds and private bungalows have mattresses on the floor. All have sheets, pillows, bolsters and a mosquito net. An extra bed can usually be organised if you require one. 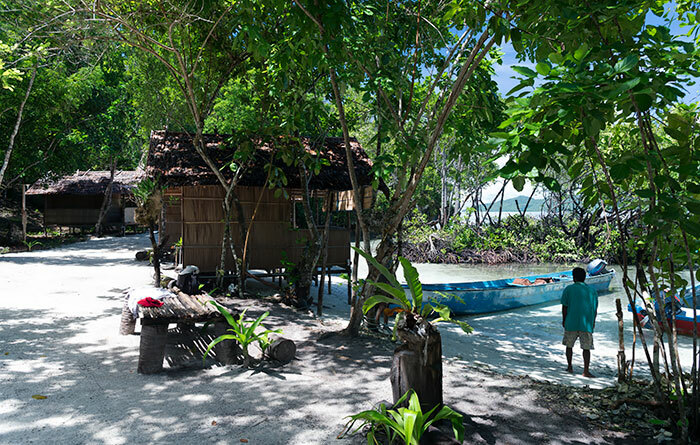 All bungalows have verandahs equipped with hammocks and a table and chairs. VIP bungalow bedrooms have room light switches, power outlets and a fan supplied. Meals are served in a dining shelter that has sea views, two large tables with bench seating and power outlets for charging devices. Free drinking water, tea and coffee are always available there for guests. The nearest village for purchasing basic supplies is Sawinggrai. At low tide it’s possible to walk to neighbouring Nudibranch Homestay, and from there along a concrete path to Sawinggrai. Please do take any inorganic rubbish you create away with you when you leave as there is no non-polluting method of disposal of waste like plastic and dead batteries in Raja Ampat. Leaving such trash on Gam will only contribute to Raja Ampat’s growing rubbish problem. English is spoken at Daroyen Village. Waisai to Daroyen Village transfers are available by speedboat or longboat. Longboat transfers are only available subject to weather and sea conditions, can only accommodate 2 passengers and cost IDR 750,000 each way. 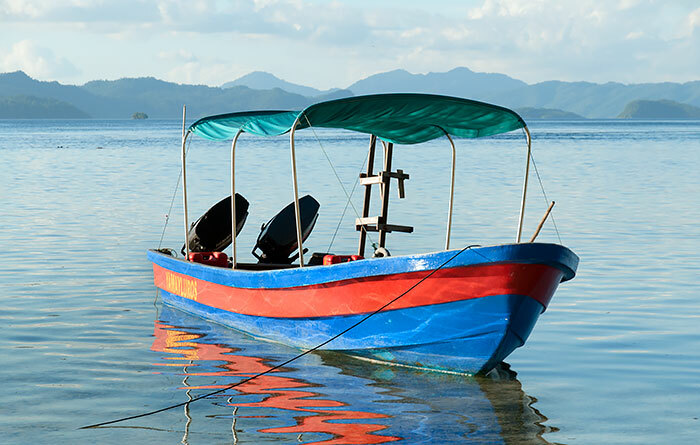 Speedboat transfers can carry up to six passengers and cost IDR 1,200,000 each way. Both prices are per boat trip, shared among passengers. 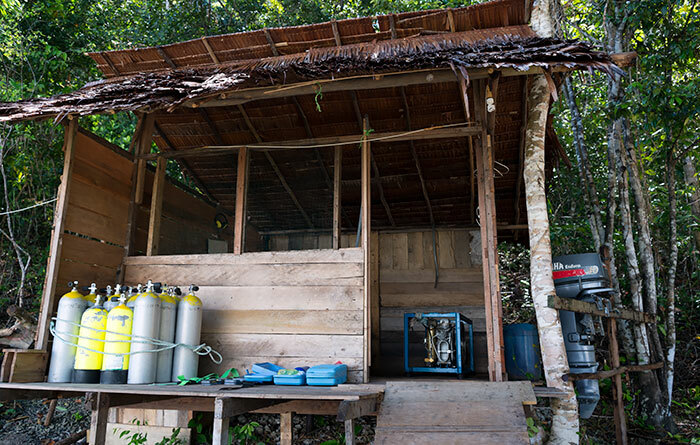 Daroyen Village has an onsite dive centre equipped with dive gear for up to 6 divers at a time, compressor, emergency oxygen and first aid kit. 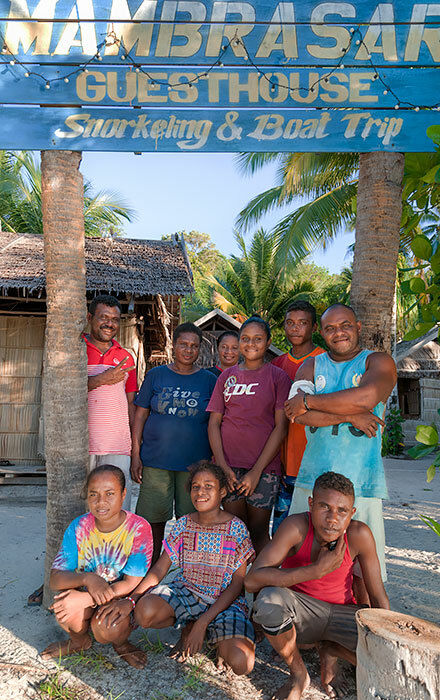 The fringing reef and blue water mangroves at Daroyen Village provide fantastic snorkelling and diving, but beware of exceptionally strong currents when the tide is running. Daroyen Village owner Pak Herman Mayor is one of Raja Ampat’s original dive guides and has a wealth of experience and knowledge to impart. Back in the late ’90s he was a guide for Dr Gerald Allen’s exploratory expedition, which triggered Conservation International’s 2001 marine rapid assessment survey – the first scientific study to chart the richness and importance of Raja Ampat’s marine biodiversity. More recently Pak Herman has led a Korean television team to film leatherback turtles nesting at Saursapoh. In addition to the great diving and snorkelling available at and around the guesthouse, Daroyen offers guided diving and snorkelling tours for small groups to the best Dampier Strait dive sites. These include Manta Sandy, Cape Kri, Friwen Wall, Chicken Reef, Sardines, Mike’s Point, Mioskon, Blue Magic, Cape Mansuar, Sauwandarek, Yenbuba Jetty, Turtle Point, Batu Lima, Sawinggrai Reef and more. Not included: Sorong-Waisai-Sorong public ferry tickets, Sorong hotel accommodation and Marine Park entry tags. Daroyen offers a 7 night accommodation package that includes 5 day trips to various snorkeling locations as described above. Also included are airport pickup, Waisai transfers to and from the guesthouse, three meals a day and unlimited tea and coffee. Not included are Sorong-Waisai-Sorong public ferry tickets, Sorong hotel accommodation and Marine Park entry tags. The package costs IDR 6,450,000 per person for couples sharing a room or IDR 8,500,000 for single occupancy. The five snorkeling day trips are guaranteed and have no minimum group size. Prices are in Indonesian Rupiah. Gam Birds of Paradise birdwatching tour is per person, others are per boat, shared among passengers. Birdwatchers will enjoy simply lazing around the guesthouse trying to spot the variety of birds that fill the local jungle with their song. Long walks are comfortably made on a coastal concrete path between the villages of Sawinggrai and Kapisawar and Red Birds of Paradise can be easily seen a short distance into the jungle from Sawinggrai. Daroyen Village’s location is showcased in this short film made by guest Wisnu Widjaja. Yohanes who is good organizer, very kind, helpful and helps me a lot in this trip. He always speedy reply your whatapps and email. Domi who is very friendly, helpful and thoughtful as well. Yoram is a great DM that guide you diving in amazing place. 3 guys and their teammates are very nice. Their is a simple, peaceful and natural place. None of AI (Artificial intelligence), Rich of pure. No concrete wall. Only a green trees and mangrove surrounding you. No TV, car and traffic light sound. Only listen a birdies, Mr. Daron(cockatoo), gecko and doggies speaking. Day time is going to diving or snorkeling. Night time can see the crab grab the bugs for their dinner. Food are simple but is taste nice. Especially, they bake the green cake that is so delicious. Mr. Daron & 2 doggies might join with your meals sometime. 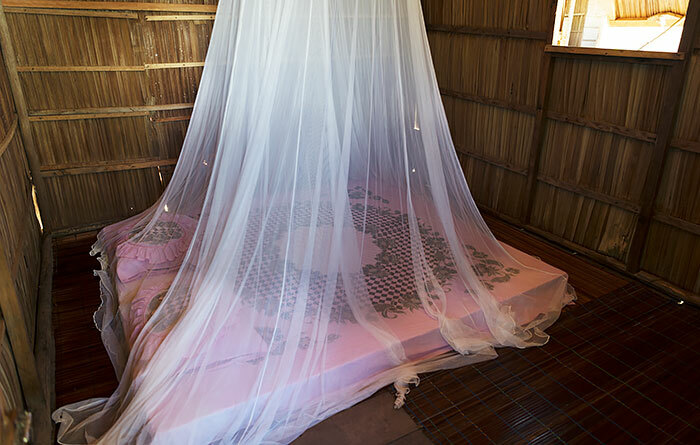 Room only have thin mattress on the wood floor and mosquito net. The power will on after sunset till to the Sun ride up. You can charge your battery in your room. They have morning call service. 3 handsome roosters will on time call you wake up everyday. You can laid on the hammock to listen the wave and feeling the breeze. Tide low with small beach, tide high have small fish. Please understand that their is a homestay, not a hotel. It is a very far place but full of beautiful nature. Thier english is not very well but they will try their best to help you. Without fresh water for bathing and showerhead. No rubbish station. Please bring all your rubbish back to city. It is safety but a bugs will attack you. So, don’t forget to bring the insect repellent. Otherwise, you be their meals. Telkomsel sim card is the best signal. There are only have full of color of corals, a shool of big and small fish, manta, group of sweetlips fish, black tip sharks, wobbegong sharks etc, clearness blue water that you can see the bottom and green in everywhere. Please pepare and search all the information and stuff before you go to the homestay. Thank you so much of Daroyen teammates. I’m very enjoyable!!! We stayed 1 week at Daroyen Village and booked the 7 nights and 5 days snorkling package. We had a wonderful time here with Herman and his family. We went to two different snorkling sites every day and Hermann always went with us. He was an excellent snorkling giude. Without him we would have missed a lot of things. For this our expectations were even topped. There is also a nice housereef and a small mangrove spot where you can snorkel depending on the current. You may see turtles, reefsharks, seasnakes and walking sharks. The huts were basic but airy and about the food you could not complain. There was always also vegetables served, even pommes one day. We can only recommend this place. Herman is a very honest guy and reliable. He cares for his guests very much. Don’t miss the birds of Paradies! can definatly recommend this place for days where you dive a lot. by far the best you can get for this price. It is a good feeling to read your review. Especially you enjoy all the dives and for recommending Daroyen Village to others travelers. We hope we will see you again soon! Very good stay and diving with the team. We saw dolphins and manta rays two days in a row. Paradise bird watching can be arranged, it is just nearby. Come with the right expectation, understand that the fresh water is a scarce and precious resource in this part of the world (as well as the country i came from) and you will be fine. Food was good for me, if you prefer less spicy do let them know. Generator will run in the evening throughout the night. Walking shark and cuttle fish come right up to the shore in the evening. Email correspondence with Yohannes is prompt. Bring your own equipment for maximum diving pleasure, bring reef hook especially cos you will need it at area with strong current to see mantas. Bring dive torch if you want to do night dive. The starry night sky there was brilliant. Thank you very much for your visit and for taking the time to write the review and reviewing us on your blog. We are glad you enjoy your stays in Raja Ampat. We hope we will see you again the near future. My partner Chris and I visited Daroyen homestay in September to do some diving. The bungalows and toilets are basic, but we didn’t spend much time in them. Instead, we enjoyed our dives tremendously, as each site Hajja and Herman took us to was more beautiful that the last. In total, we did 8 phenomenal dives with them. Hajja was a hardworking dive guide who truly wanted to please his underwater guests. It’s obvious that he loves the coral reef, and diving with him meant we’d see what we came to see, whether it was black tip, white tip, and wobegong sharks or the tiniest of pygmy seahorses (he found three for me!). It’s worth noting that the currents of Raja Ampat can be quite strong. It’s also worth bringing your own dive gear, including a reef hook for each diver. I was glad Rajja had a couple extra for us because they definitely came in handy. We had such a nice time diving with Daroyen that we stayed an extra night to get in a couple extra dives. We truly wish we could have stayed another week or more. Thank you to Herman, Hajja, and the families for providing such a pleasant stay for us. (It was much appreciated that we could make our payments via credit card machine, as getting enough cash out is nearly impossible.) Herman definitely went above and beyond after our trip to see us safe and sound in Waisai. I owed this review to the family that run this place. We stay in December last year the busiest time of year everywhere except Daroyen, which seems have controlled limit number of guests. 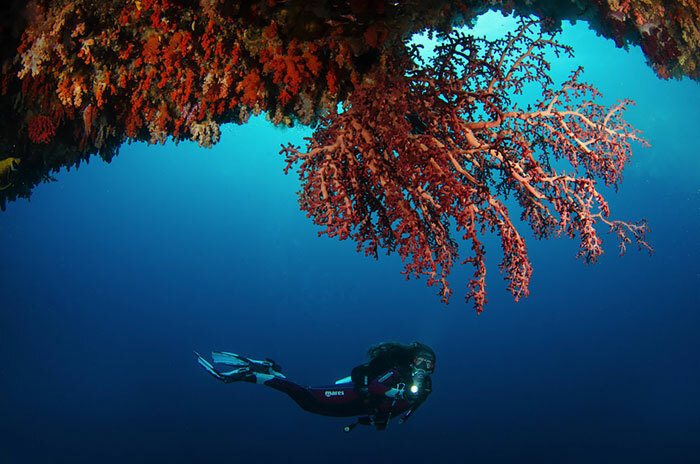 Diving is great all around Raja Ampat and Daroyen is no different. But Gam island offer a bit more which is diving in sites few boats willing to go. In our case, we were the only dive boat that explore Gam’s hidden gems. Special credit to Troce for the great cooking skills. Her smoked tuna is to die for. The smoked tuna is a long tedious process of cooking. In the afternoon, an old man will arrived in a small wooden boat to deliver his daily catch, fish that he caught with traditional hand fishing technique. They clean the fish and use coconuts shells to slowly cooked the fish real good for long time. The result is a moist delicious meat with hint of smokey flavour but not over powering. I missed the food. I envy their high quality fresh fish everyday instead of processed food. I asked them to make sushi using the fresh fish but they don’t know how and fear guests get sick from raw meat. Maybe one of these days, anyone with extensive knowledge of sushi can share their experience in Daroyen kitchen. On my way home, I picked up a smoked tuna in Sorong market thought it will be the same. But its not. Thank you for spent time to write the review. We appreciate your highlight for food serve during the stays. In Daroyen Village, we serve only fresh fish and cook with not too much spicy. We often have guests cooking in our kitchen and we always open for people that want to make their own food. We hope we will see you again. Next time on your visit, we will prepare smoked fish for you to take to home. I give everything 5 stars because its exactly what I am looking for. A quite little place from this 7 billion people on earth. I also give them special 5 stars for their honesty. My wallet full of money fell on first day I arrived. I thought I lost it in Waisai because we search Daroyen boat and shopping bag but couldn’t find it. On the 3rd day, Herman’s son stumbled upon it on the beach hidden beneath mangroves roots and return it to me. If it had not been the tree and his son, my money is at the bottom of the ocean. The only thing I will give 3 stars perhaps the lack of fresh water. But so does every dive centres and homestays on Kri island and Arborek. Its a bit discomfort at first but you’ll get used too it. Daroyen actually have fresh water source but very cautious in preservation. They only use it for drinking water, cooking, and laundry. 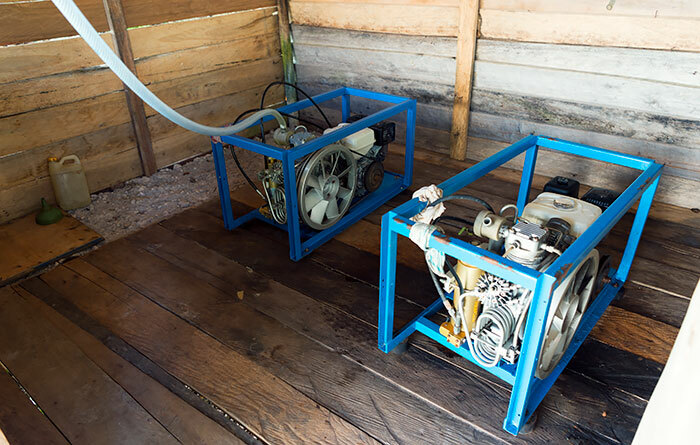 Because they are on the small island, they can’t risk using pump to draw the water and risk salt water intrusion to their only fresh water supply. Dive guide and crew really experience. They took us to remote dive sites and we were the only dive boat that explore the area. No dugong sighting unfortunately. But we get to see lots of shark, turtle, bumphead, ghost pipe fish, frog fish, cardinal, barracuda etc. Too many to mention, I think I saw dolphin but not sure if its dolphin or dugong. Highly recommend this place. Definitely will return. Thank you for your lovely 5 star review for Daroyen. We are happy to welcome you in Raja Ampat. We are glad to read that everything is your satisfaction and you enjoyed your whole stay with us. Thank you again for taking the time to write to us and we look forward to welcoming you again. Great diving and delicious home cook meals everyday by the ladies of Daroyen that passionate at what they doing. Very organized and smooth arrangement from the time we arrived until the end. 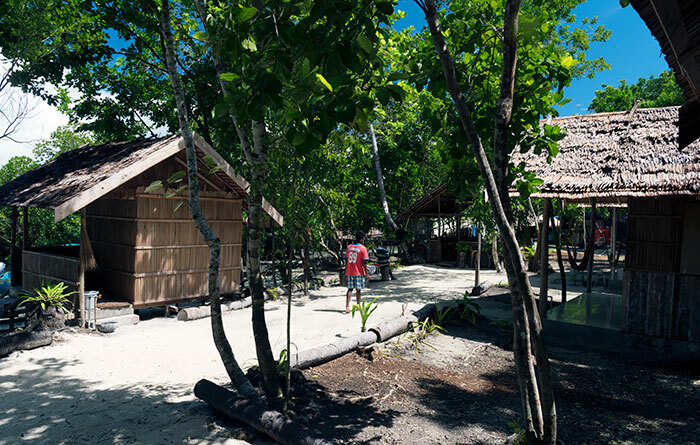 Its a simple guesthouse but managed professionally by nativa Raja Ampat. We surely recommend to our friends. Many thanks for the compliment. We glad you enjoyed the trip we have planned for you before your arrival. Thank you again for recommending us. We hope we will see you again soon. Just want to thank you for the help with stayrajaampat website. If its not for the review written here and tripadvisor we would not have visited. Love Daroyen Village. The place is not like the popular part of Kri but more quiet and offer better privacy because they are the only one on the island. The snorkeling and diving has more variety, we found lots of critters. Ignore the comment below about poor air and mouthpiece wash. We have been diving for years…we never met a dive centre that has a special place to wash mouthpiece. All operate the same wash and rinse system, Daroyen did the same. The owner is a responsible gentleman and focus. As a diver, you need to take full responsibilty on your own safety and health. Tips: set your expectation straight. This is a simple guesthouse with dive centre on remote island. Take your time to adjust and only then, you will be able enjoy your time. We thank you for your ratings for Daroyen Village and also to all guests that have give reviews and critics in our email and website reviews. 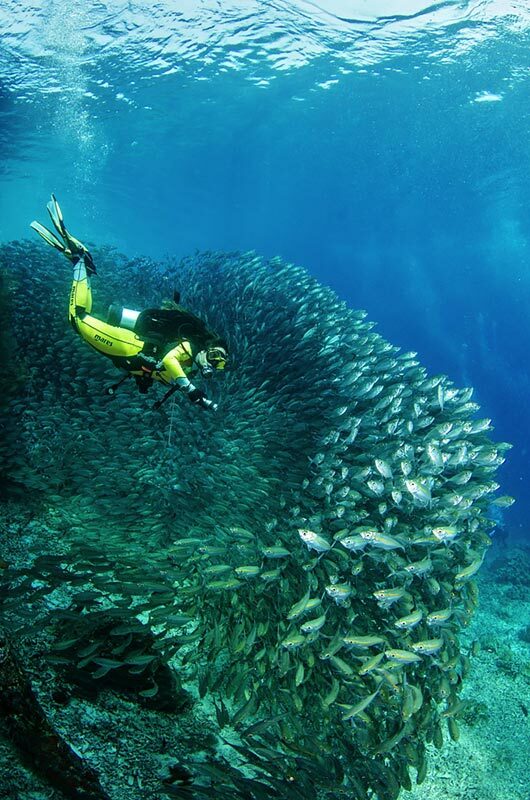 There are lots of dive sites to explore from Gam island with beautiful reefs and different kind of fish. Shark and turtle are too common at Daroyen Vilage. We like to bring our divers to see rare creature in various shapes and colour. Thank you again for your support and we will see you next time. In one dive at Daroyen house reef, I saw two frogfish and several rare blue ring octopus. I never thought I had such good luck to see it. Its like I don’t have to look for them at all. Just one dive at the pier, there they are. This is my favourite house reef. I highly recommend if you are macro divers. If you don’t like critters, no problem. Shark, turtle, bumpheads, fussiliers, etc are easy to find too. 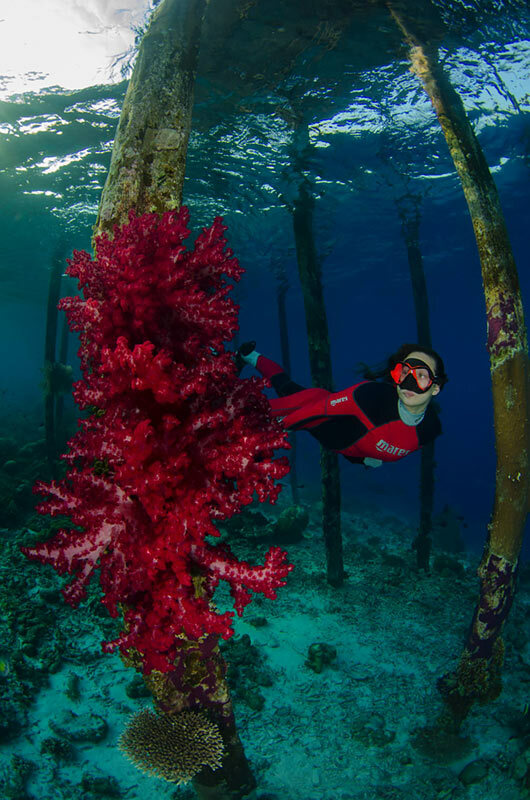 Ask them to take you to their other secret dive site for red pygmy seahorse and sharks sighting all in one reef. The diversity is just amazing. Food is plenty and accommodation is good. The only downside is salty water for bathing but this is understandable and you get used too it. Places in Kri don’t have fresh water either. Have fun diving and adventure! Thank you for your visit. We are glad you really enjoy the organized dive trips we had plan for you ahead of your arrival. Thank you for the highlight of Daroyen house reef. There are more things to see in Raja Ampat and we hope we will see you again. We visited Raja Ampat back in February. But we didn’t stay here. We just want to say thank you to Herman for their help. We had accident due to strong current. This is not a fault of no one but ourselves. While snorkeling around Gam, me and boyfriend were carry by strong currents and didn’t realize it until too far too late. We tried to swim back but the strong current beat us further from the land. We tried to ask help from several boats but they either too far to hear cry for help or just didn’t see us waving. Luckily…Herman and his guide whom at the time on their way to explore new dive sites location saw from far distance our colour. They slowly approaching unsure what they saw. As they see hands in the air…the boat put into high speed to rescue. As soon as we in the boat they check our condition make sure we are okay not injure. They gave us their food and make us drink lots of water and offer to take us to the hospital. We only ask him to return us back to the land. He gave us cold medicine from his first aid kit because we were in the water for sometimes if in case we have fever at night we might need them. I mention I need to buy tampon, he also have it in his bag. We both traumatized by the experience but grateful for their assistances. Before we left for Waisai, we made a stop at Daroyen to say goodbye and to gave them money but they flat out refuse the 1 million. We can’t say thank you enough. Thank you again Herman and the crews. Thank you Daroyen Village. Next time when we visit, we come to visit you! We stayed at Herman a his family for 4 nights from 8th till 12th January and was diving with Kamber. We had a great time with them, could not complain about anything. The food and accommodation was good, and the dives exceptional! Kamber was very professional and the briefings were very detailed. We wanted to see oceanic mantas, of course, and Kamber and Herman made it there mission. It was successful! The only remark we have is to a transfer fee to Fam, which we feel was a little overpriced. But the rest was great and we would recommend staying and driving at Daroyen Village. Our stay at Daroyen turned a dream of diving in Raja Ampat into a nightmare. We put our lives at risk diving with them and we hope by leaving this review they will now learn from our experience and fix the issues for future guests. I would like to say that all communication with Yohanes both before our visit and sorting out the problem was excellent and she offered us a full refund without hesitation (we did not ask for a refund, she offered it to us!). The family who fed us were also lovely and we thank them sincerely for looking after us. It was a shame that our introduction to diving in Raja wasn’t as good. Clearly there are no safety or cleaning standards adhered to and the crew didnt appear to understand how to inspect or maintain the diving gear. Let me start with the equipment. The most concerning factor was the compressed air we were breathing which was contaminated and left one of our group of 4 with a headache after the 2nd dive, another feeling dizzy and all 4 of us feeling a little “off” the next morning. Upon inspection of the compressor room when we had returned from our 3 dives, the filter was black and should have been changed a long time ago. There was no proper exhaust outlet and the air intake was far too close to the exhaust, no wonder there was a problem!! The crew then opened up the compressor filter which showed it was black and filthy and obviously needed cleaning, which they then did but too little too late, we had already been breathing the air for 3 dives. We used the tank air to clean the dust cap on our personal regulator but this only made the cap dirty, proving the air in the tank was indeed contaminated. As mentioned, all 4 of us felt terrible the next day, after only 3 dives this can only be due to breathing contaminated air. In hindsight, when we smelt the air in the buddy check that we always do, we should have chosen not to dive but we let the excitement if diving Raja Ampat cloud our judgement, a mistake we will never make again!! Beware and always be cautious! Out of our group of 4, 3 of us needed regs and bcd and all of us had leaks and bubbles in different ways, but we found this out as we were gearing up which meant none of the equipment was checked by the crew prior to loading up the boat. One of the bcds had a very slow inflation which could have caused an issue if we had met a down current. The SPG was leaking badly on one on the regs and we had to borrow a set from a liveaboard for the first dive but it had to be returned for the remaining 2. For the final dive, the O ring burst on the final dive so a childs tank was used for an adult male and the guide had to dive with the same tank used for the previous dive. The guiding wasn’t up to the standard that we had read in reviews and, no disrespect to our guide Kamber, but he didn’t find anything of interest to show us, we saw nothing “special”. Our final dive was at a jetty (which others have said is a fantastic site when dived correctly) and we were taken “there and back” in a reciprocal line over broken coral and past a school of bat fish who had clearly been fed due to their clingy behaviour as we dove by. 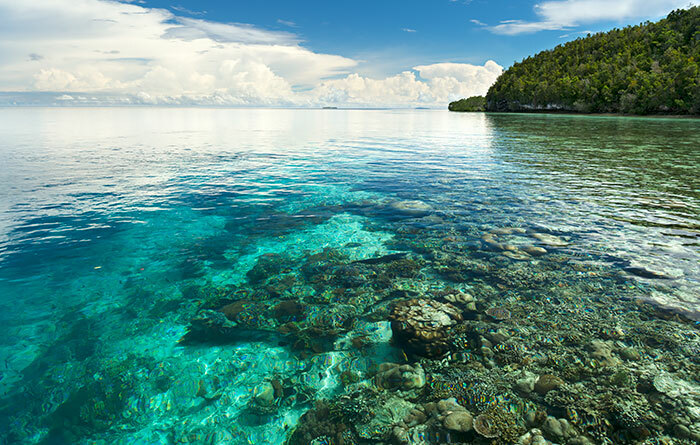 We didn’t come to Raja Ampat to see broken and dead coral, its an area known for its pristine colourful coral. When we returned to land, there was nowhere to clean the equipment which made me realise that the mouthpiece we had been using wouldn’t have been cleaned from the last person who used it, and wont be clean for the next diver (we moved to another dive centre and they had this facility). No one made any effort to begin fixing the problems we had mentioned so if we would have dived again, we would have used the same faulty gear (after we brought this to their attention they did make attempts to fix everything). That is when we phoned Yohanes and she sorted everything out. I am grateful that we had an Indonesian simcard that meant we were able to contact her on WhatsApp. She was apologetic and offered a full refund and made the paypal deposit refund immediately (we left some money for the ladies at the Homestay for the food and water they gave us during our stay). Unfortunately the same cannot be said for Herman who is based at Daroyen. He became angry with us and didnt want to speak to us or tell us what was happening. We had paid the balance of our stay as requested upon arrival (which I later heard was unusual as other Homestays take payment at the end). We paid with cash at 8pm Saturday evening and at 6pm Sunday evening we were told the money had been paid into the bank and we would have to wait until the next day. His attitude left us feeling uneasy with the situation we were in as we didnt feel safe diving here and it was awkward to now stay here, but all our money had been given to them and we now had to try and find alternative accommodation/diving. Thank goodness I had done research from the Stay Raja Ampat website for other options and we had an Indonesian simcard to contact them. Its unfortunate that we went to sleep feeling powerless and wondering if we would get a refund, uncertain if we would be able to leave this accommodation and if we would be able to dive Raja Ampat and see its true beauty we had heard so much about. Herman left at 8am for the 2 hour round trip to Wasai to go to the bank returning at 12.45pm to thankfully give us the refund. Our transfer to Kordiris was waiting, we left at 1pm and thankfully our diving and stay at this new Homestay showed us how our journey should gave begun. Raja Ampat is stunning and the diving is spectacular, we are sincerely grateful that we were finally able yo see this for ourselves with another dive centre. I sincerely hope that drastic changes are made to the compressor room, that the equipment is repaired, serviced and maintained, and that the attitudes towards safety are addressed for the future. I am sorry you didn’t like your stay and the dives that we have provided. We are more surprised because your story are far from the truth. We would like to clarify the things that you have said. During the first check dive, the regulator that one person used had problem with the O ring. The guide went to change the O and had helped from other resorts who at the time also had the same problem. We usually help each other out in the sea. After the O ring is replaced, the regulator is use again for diving. Our regulator set has the whiteboard on the back of the SPG. Divers can use to write with pencil to communicate. This part of whiteboard came off because glue from manufacture no longer effective. But the SPG itself is working fine and has no leaks. The reason why you think the SPG leaks is because the glue has started to come off, there is air trapped in the casing thus when submerge, there is a little buble coming out. We tested the SPG in the water and found no leak at all. Your story about us borrowing from liveaboard don’t make sense. We have witness here of Papua Explorer a land based also on Gam that know the truth because he the one that offered help. I think you may have confused the fact in this part of story. We brought a spare regulator on the boat when one need to be fixed we take that one out. That regulator is belong to us. The final dive in Saondarek Jetty, one tank has only 180 bar with O ring worn out but easily replace. The guide suggested he will use the 180 bars tank and gave you the short fat tank that has 200 bars. I am very surprised you can not tell the difference between child tanks and adult tanks. First of all, we don’t have child size tanks. All tanks are regular adult tanks. There are two types of scuba diving tanks. One is tall and one is shorter and fat. Both tanks have equal capacity. You mention out of 4 people rent BCD and all leaks in various places which again is not true at all. Upon return from the dives, we received a complain only one BCD has problem with the inflate and deflate. We checked the BCD and it was working fine. But we gave you new BCD just to be sure. That’s the only thing we hear from the whole group. The guide didn’t see any leaks on any BCDs and we never heard from anyone about BCD leaks either. Your story about dirty air compressor is not true at all. We have two Bauer dive compressors that service and maintain regularly. Filter are always replace every 80 tanks refill. Its a standard for tropical country. The tanks you used is refill 35th, we are still far from the need to replace filter. Our compressor set up is the exhaust face toward land and the air suction face the sea. The pipe is 5 meters long and nowhere close with the exhaust. You find this similar set up in other dive centre. Let me explain about air compressor filtration system works. There are two parts filtration system; molecular sieve and active carbon or charcoal. Molecular sieve has white colour, it acted to absorbs humidity in the air. Active carbon or charcoal has black colour, its main function to absorbs chemicals in the air before compressed in the dive tanks. Another exaggeration about you used the tank air to clean the dust cap on regulator but this only made the cap dirty. Here is the question, if the cap is dirty, why the porous filter on the 1st stage regulator didn’t turn black? Remind you, all other guests that come after you left didn’t have have complain. They all use tanks refill with same filtration. Diver diving with bad air is not a responsible diver and we will be in jail for negligence. You did three dives. Allow me to explain. Each tank has 200 bars. Assuming you use 5 – 10 bars to adjust buoyancy and 50 bars left for 3 minutes safety stops. You breath approximately at least 130 bars from each tank or 390 bars from three dive tanks. If the air is bad, no one will be able to do one dive without suffering serious headache and vomit. Because air you breath is condensed CO2. 2nd dive will put all of you to the hospital with possible brain damage or dead. NO ONE can survive to do three dives. Our guide will have never risk his own life for money to do that kind of dives. He will cancel first dive, return to the base for immediate assistance. After you have left, we did further examination and concluded the problem is not air compressor or tanks. Its more likely the dizzines and lightheaded you have experience is due to exhaustion, lack of sleep and jetlag from long journey to Raja Ampat. The first group flew from Lombok – Jakarta – Sorong. Another couple flew from abroad – Jakarta – Sorong. You all had travel many hours by plane add ferry and boat ride. You all still tired and jetlag usually last 3 – 4 days. The next morning, the boat leave for first dive at 8:00 for the check dive. That is why you all feel lightheaded not to mention water temperature had drop that can also contribute to the headache. Had we known the cause earlier instead of blaming ourselves at the time. We would have only issue partial refund. After you have left, Herman went to dive with the same tank because he felt uneasy with your complain and after return from the dive he didn’t feel anything. Thus we come to our conclusion its not our fault. Your complain are exaggeration from the truth. You said you are experienced diver but you couldn’t tell the difference between child tanks and regular tanks and you have no idea how compressor filtration system works. You mention a liveaboard lend a regulator which is not true at all. 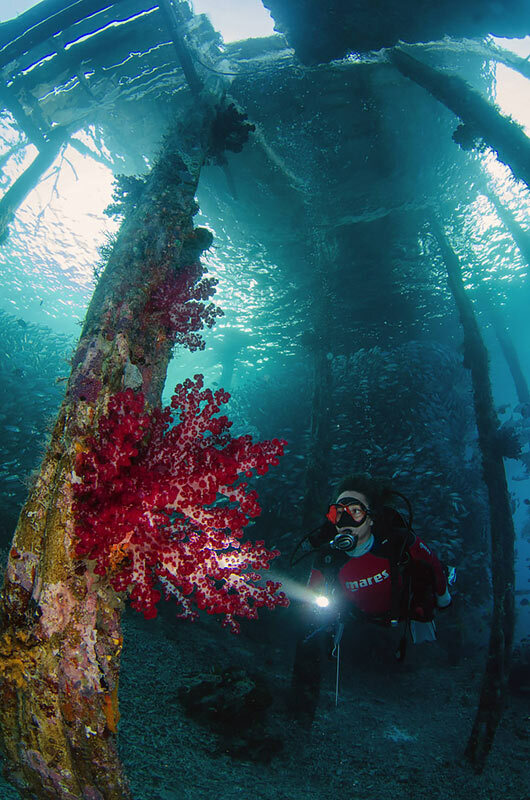 A liveaboard in Raja Ampat will never lend their regulator for other to use. You also complain that you didn’t get proper briefing, when in fact the guide had brief the night before and again on the boat with white board. We have another guests came from Mangrove homestay after you have left. They did two dives a day. They too use same equipment and the same air tanks refill from same compressor and same filter. We give them same BCDs and regulators. There are no complain about lightheaded, dizziness or headache. We don’t receive complain about leaking BCD or inflate not working. The equipment you used also used by previous guests, but none complain about BCD leaking in various ways except you. You complain about Herman did not want to speak is not true either. He had mention to you that he will refund all payment. He came to all of you in the dining area with Kamber to explain. After he explain, two people came to ask about money again while he is in the kitchen. Herman then explain again. About 30 minutes or 1:30 AM you and husband come again to demand the money. Herman then explained again and he also ask you to relax and go to bed, you will have the money tomorrow. We are frustated because Herman himself and the guide both had come to you to let you know about refund before you even asked and I had also explain to you but that too is not enough. The next day, early in the morning Herman left to withdraw the money. Because there is a problem with bank internet he had to wait and come later in noon. We just confused why you have said those things that are not true at all. 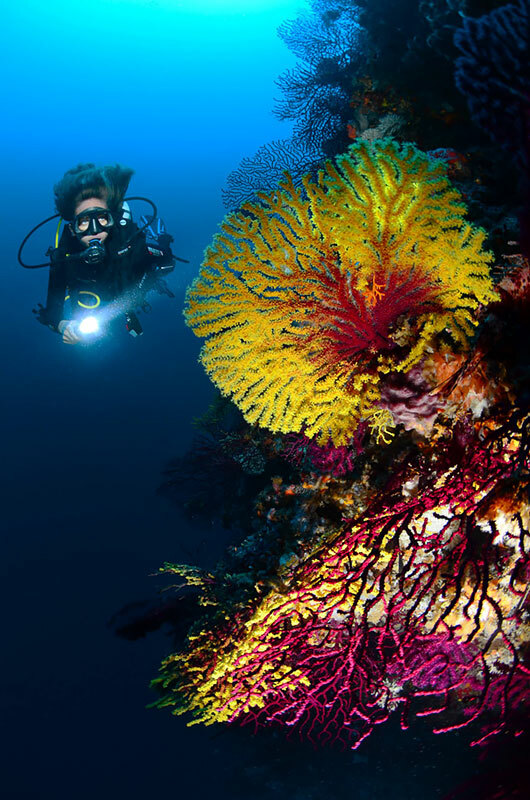 We are one of the reputable dive centre in Raja Ampat. 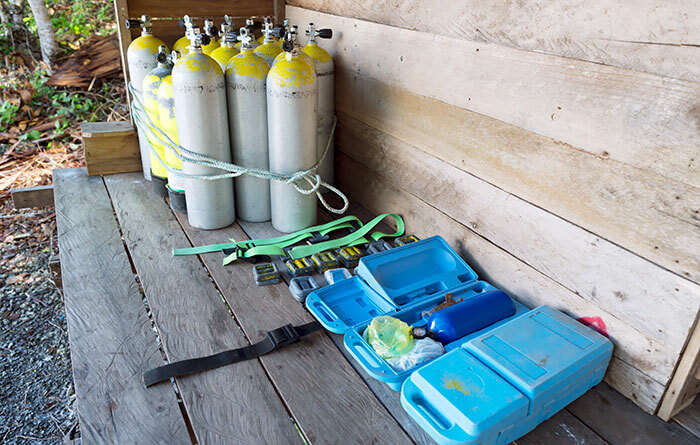 Our dive boats are equipped with portable emergency O2 and First aid kit. Our guides are experienced and both of dive compressors have annual service. One that we use to refill your tank had a service by a technician from reputable dive shop from Manado on November last year 2017. Another one is due for maintenance work on March. What we did wrong when you had your complain, we were quickly panic and blame ourselves but did not taking the time to assess the situation properly. We should have get one tank and test it in one dive while you are there to witness and make the assesment based on the fact. Never the less, this is a good lesson for all of us here in Daroyen Village and other homestays with dive centre, that when guests have come to complain we now know better to respond. Thank you for the reply. We have already spoken to the Stay Raja Ampat website administrator about this review before posting, and they assured us that our review was not critical or negative and merely stated the facts of the experience we encountered, not once did we mention something that was not true. I am sorry you see this as an attack but it is not, it is a review for you to use to make improvements for the future, should you choose to do so. If you put as much effort in to the improvements as you have on your reply then things will be awesome at Daroyen in the future. Thank you for your reply. You did mention about child tanks, leak spg, air compressor filter that all black and you did threaten us that you have travel website feetdotravel.com that you will use. We merely verify your story the fact we do not have child tanks, we checked spg do not leak, the black thing you said dirty filter is in fact activated carbon, and all dive centre use bucket fill with fresh water to wash equipment. Experienced divers should have been able to tell the difference between regular tanks and child tanks, activated carbon is basically charcoal, white part at the back of spg is tiny whiteboard etc. We would like to clarify that not once have we made any threats towards you regarding our travel website. Not once. You feel the need to keep talking about “experienced divers should know this and that” and being rather aggressive with your comments to the point of being personal and not professional. We stated the facts in our review and are not going to get into a conversation defending what we know to be true, what we saw, how we felt and what we experienced as you are not prepared to listen. We will repeat again that this review was sent to Stay Raja Ampat Administration in advance of it being published as we wanted to ensure CHANGES ARE MADE SAFETY OF OTHERS but you don’t appear to be seeing it that way. It wasn’t an attack on you, diving is an equipment based sport so it is very important issues are addressed, however all you seem to want to do is be personal with you response. Daroyen gets zero points from me. It could get one star for the diving, but the star really goes to Raja Ampath not to Daroyen. My stay lasted only 2 days instead of the 17 days I was scheduled for. The accommodation was dirty, the matress covered in dirty spots. The privat bathroom was a mess with the shower a bucket of salt water. There was no space to relax exept for the uncomfortable hammock at the front of the hut. The place is also very isolated. There was no village, no path, no shop and no way out exept by boat. I found the stuff unfriendly and unable to answer my questions. The diving station was messy compared to normal standarts I have experience in other places. To leave and move to another place I was required to pay 4 Million Rupiah in addition to a 20% deposit i have paid from Germany for my 17 days booking. I definitely could not stay here for 17 days! Have since found out it is not usual to pay a deposit for homestays. The prices here were more expensive, than other places I went to. I also know, daroyen has moved here from Kri and many of the good reviews relate to the homestay when it was on Kri. Also some of the fotos from the Daroyen page seem not to be of the homestay, they look to be of other places in Raja Ampath. I would not stay here again. Thanks for taking the time to leave a review Sonja. It’s a shame your experience was at variance with most others, and hopefully the problems you mention will be rectified. Daroyen relocated from Gam in April 2017, so all the reviews below that are dated after that are for their current operation. With the exception of the family photo and the diving photos credited to Daroyen, all the images in the gallery above are from their current location. 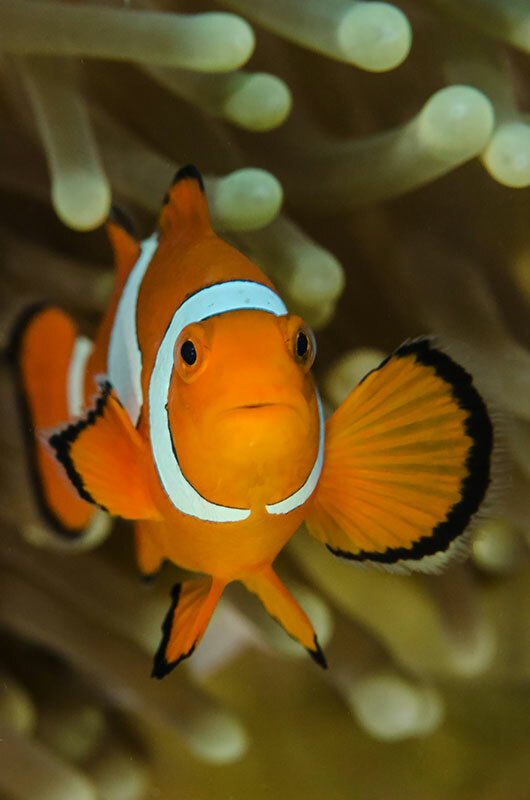 The diving photos are from Raja Ampat sites that guests can dive with Daroyen. We expected there will be multiple bad reviews from this group of guests with various bad reviews and we already reply to her review at Tripadvisor. Below is our reply to her review. I am sorry I have to use translation and write in English. I am sorry to hear that our places have not met your expectation. 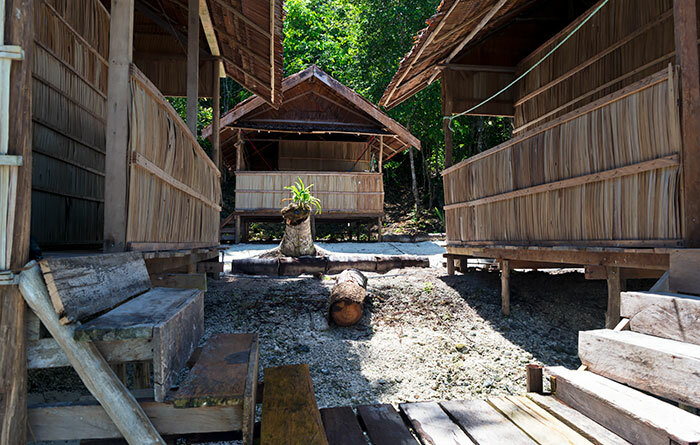 We realize that our place is a simple accommodation on a remote island in Raja Ampat. 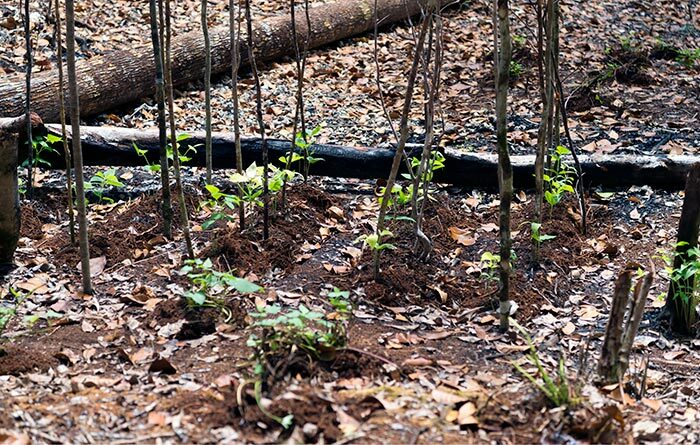 We are isolated from other resorts, our beach has mangroves that protected the land may not be suitable for everyone. Therefore, we provide as many details information as possible on our website and email. We were contacted by you since May and made booking the same month. Between May to December we had been answering all emails from you and your group in regards to our accommodation and the dives. You decided to book with us during the peak season of Raja Ampat from December 18 – January 4. We only have 7 bungalows. Two of the bungalows has ensuite bathroom and we give them all to your group. Your group have 4 people and requested 3 bungalows, we give a discounted prices for 2 bungalows 4 people since you will be staying a long time. Your group are in effect only pay for two bungalows at discounted prices and one is free. We just want to tell our side of story and let the travelers to make own decision. You mention no one greeted, no one pointed, there was no explanation of anything and no dive base leader. First of all, we arranged your airport pick up to the harbour, when arrive in Waisai harbour you were transferred with boat to Daroyen. We have Metos our guide leader, Diego an instructor that arrived the same day as you are, and also another local guide Hagja. If there is no one greeted your group, how can we pick you up, meet at the harbour, and transfer with speedboat to Daroyen. Its not possible. You mention many defects on site such as no fresh water, masses of ants and dirt. 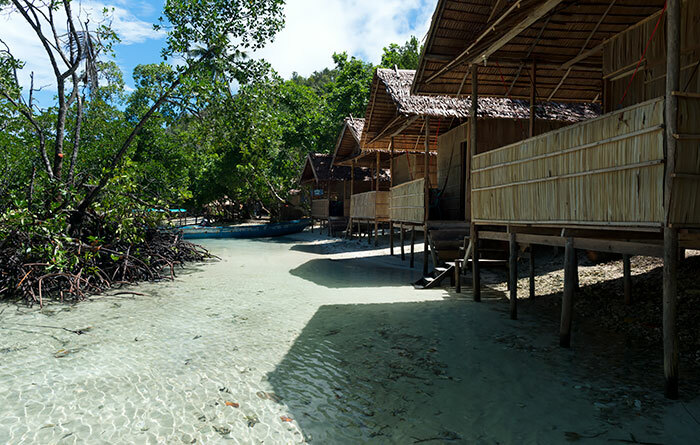 We already mention that we have limited fresh water and Daroyen Village is a simple accommodation surround by nature of Raja Ampat. Off course there are ants, small crabs moving around, birds, etc. Its all part of nature. Not too sure when you mention dirt. The place is being clean daily. Thanks to mangroves on the beach, plastics garbage don’t land on our beach in massive number. You mention that your friend has been injured on smooth and wet tiles. Your friend upon arrival went to bath at the beach. She then walk to bungalow porch with wet feet, slips and fell. Your friend did not fell because the tile is wet. The bungalow tiles is dry. Your friend fell because of her own wet feet. You complain about smooth tiles. All tiles for floor are smooth. You complain about the lack of beach and no seating area around the beach. 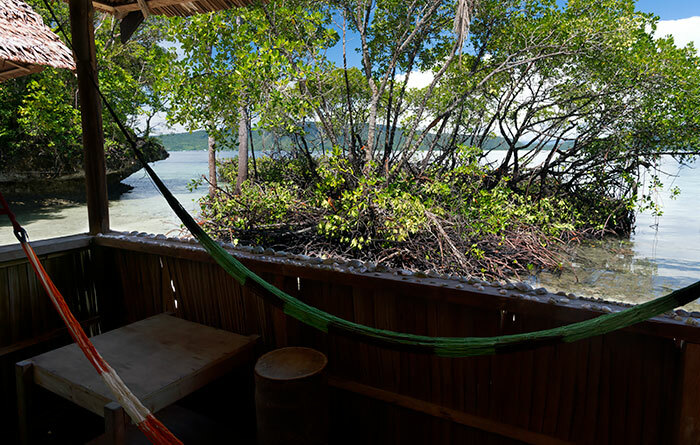 You did not mention we provide hammocks, that you have seen our website, and the youtube video of our location the beach is protected by mangrove which not also prevent erosion but plastic wastes from the sea. You mention about moving to other places and want to dives with us. But you did not mention it here to other travelers, that place you want to go is on different island. You did not mention, if we pick you up from that place it will add fuel charge but you still want diving with us because you know our price is cheaper. You did not mention you booked as early as May for three bungalows, two bungalows for 17 nights and one bungalow for 9 nights. You did not mention we give big discount and one bungalow we only charge for 7 nights because we are being considerate as the day of check out December 25th is a national holiday and your friend won’t be able to leave on that day so we offer free stays. You did not mention we have asked please to stay few more days and ask what we can we do more to make you stay and dives better. You refuse to understand that we only have seven bungalows in the peak season of Raja Ampat and we may not be able to rent the bungalows since August. When you left, you left three bungalows empty. You mention about giant deposit, but you did not mention we only take 20% deposit. You also did not mention there were supposed to be 5 people but one cancel due to flight and we refund the money the same day we were informed and we still give you the same price and still three bungalows. We could have only given you two bungalows and if you want three bungalows we can revise the price, but we did not. We want you to be comfortable so we keep the same price and same three bungalows. You mention you were trapped on our place and must pay ransom. You DID NOT mention that you only stay for two nights. On the next day you check out, you still dive with us and we drop you off on the island you want to go. Worst of all…you write this review on December 20th the same day you dive with us. Why not tell the truth and be fair. We keep our promise end to end. It takes a lot of preparation for a small business to be able to operate with competitive rates and still provide good services for a group that want to stay for over two weeks. We need to preorder fuel and food at least two months prior. We also must make sure boat conditon is checked, air compressor filters in its best condition and staffs are briefed each responsibility so that everything run smoothly. We understand guests sometimes want to change their plan during their stays. All we ask from our guests is to be considerate. We sometimes have people booked for 4 or 5 nights and have to return early or want to try other places. We are okay if they want to move. Some will booked for 4 nights and stays for 2 weeks. But this is the first time we have guests booked for 17 nights, stay for two nights and decide to leave. When asked for their understanding. We receive threats bad review campaign that everyone in the group will start to write on every travel website to destroy our business. Throughout the beginning of Mambrasar guesthouse and named to Daroyen Village, we have been consistently earning stars from our effort and hard work. We have been consistently improving our places and services without raising the prices. Our stars in the review speaks for themselves. We will let other travelers to read this review and other reviews about us before making decision. After looking for a homestay that offered diving over the New Year period, we’re very lucky to have found Daroyen. We appreciated very much their flexibility in meeting our requests to go specifically to the dive sites where mantas can be found. They were easily able to do this because they have two speet boats and a long boat so divers can go to different dive sites and not always go along where other divers of the homestay might choose to go. We also like the fact that the dive guiding is very relaxed and we were given the opportunity to go slow; very important when you want to take photos and videos. The location of the homestay is optimal for those who want to go diving at Manta Sandy and Blue Magic, the two sites where mantas can be found. The cottages on the beach are very nice. During high tide, a shallow pool forms that looks like a swimming pool. Very nice for swimming. Food is very good and plentiful. There’s a good mobile data signal for those who need it. Herman, the owner and his staff at the village were all very friendly. Herman himself is a very nice person and will treat you like family. Booking the homestay was so easy with the help of Yohannes. He speaks excellent english and is very patient in answering questions and making sure that our requests were taken cared of. The homestay accepts credit card payments which was really convenient. We definitely look forward to staying and diving with Daroyen. Great Stay for Backpackers! We very much enjoyed our time at Daroyen Village. Very relaxing — we left feeling much more rested and rejuvenated. The food is excellent — surprising for such a remote place — who would have thought fresh baked goods every morning! Staff is friendly and very respectful. Diving was well organized and always departed on schedule. Felt safe with the dive master and snorkeling with a guide. We got to visit nearby villages and birds of paradise. Appreciated the transport from airport to hotel and hotel to ferry. From start to end we felt very well taken care of. Thank you for taking the time to share your experience at Daroyen Village. We are all grateful to know that we made you feel amazing during stay with us. It is our pleasure to deliver a wonderful experience and make your stay unforgettable one. Thank you for sharing your room tip and we hope to welcome you back soon. Thank you for taking the time to tell us about your experience at Daroyen Village. It is really wonderful to read that you thoroughly enjoyed your stays. We are also glad to learn that you really enjoy all of our meals. We look forward to welcoming you back very soon! A nice and quiet place away from crowds of Kri island. Family that managed this place are real hard worker. English is spoken but limited. Food is tasty and always plenty. They pay attention to our need but manage to remain subtle and give us privacy. We know these guys now what they doing and feel safe when we saw the guide carry emergency O2 tank to the boat. Its good to see O2 tank and first aid med bag always presence on every dive trips. Raja Ampat is still isolated the its not worth the risk diving without some safety equipment. A suggestion, just need more chairs and table. Good thing they have hammocks for everyone. We highly recommend and will come back again. We have stayed here for two weeks. Daroyen Village is a real place on their own away from any homestay or villages. 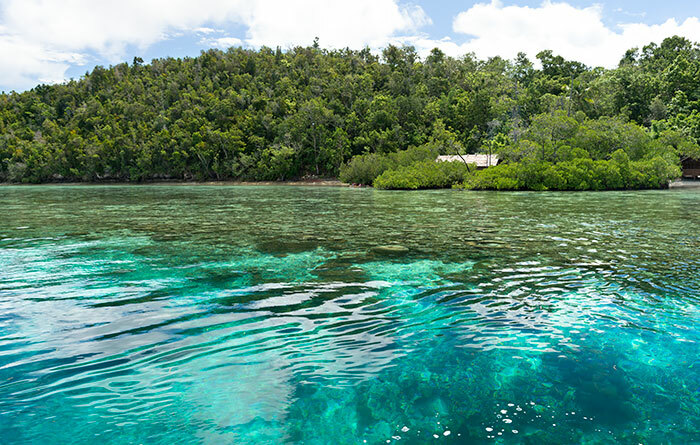 Almost hidden from already remote Raja Ampat. The diving is good, food are plenty and yummy, night time is quite and peacefull. We will come back again! Good accommodation in a small private beach. We really feel we are in the middle of nowhere. Good place to stay away from smartphone, phone call, facebook, email etc. Thank you Daroyen for the really great dives and making us feel comfortable! we’ll come back again. Thank you for your kind words. We are glad you enjoy your stay away from the crowd and exploring the island. We look forward to see you again. A simple self reliance homestay. The only homestay with own vegetables garden. They have small vegetable garden at the back of their island that they rely on to feed guests. Diving is excellent, dive guide is experience and really know his stuff. Will come back again for longer stays. Tips to other, bring your own dive equipment. 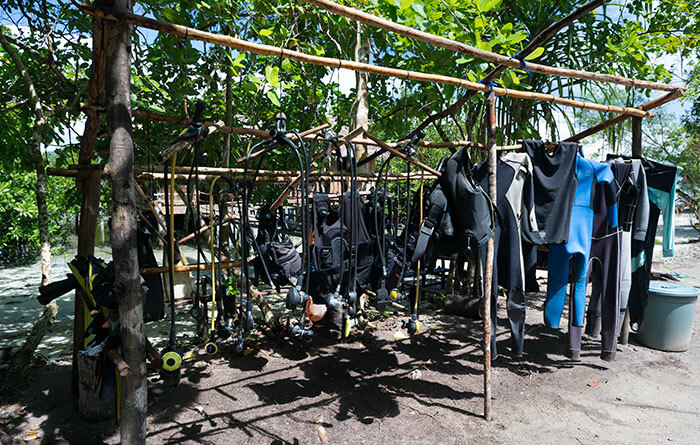 Equipment in Raja Ampat are limited. Thank you for taking the time to write the review. We are happy you enjoy the vegetables from our little garden. We stayed for 5 days at Daroyen village with the diving package. Diving was great, with good briefings and a very serious planning. We felt were comfortable and safe with the experienced guide Methos and saw many great things under water. Food and cottages we enjoyed as well. So why not 5 starfishes? 3 things which were just not fulfilled for us to give 5 stars. 1. The lack of fresh water. 2.Rented dive material was ok, but not more. We had some small issues with none working material (not threatening to us) So always check if no bubbles (or not to much) air is lost if you put pressure on the system. 3. Our cottage was too close to the generator so it was noisy during the night. We had a great time and all in all we recommend to dive with Daroyen village and their professional environment and we will do so our self, if once returning to Raja! Thank you for taking the time to write a well-considered review and generous appraisal of our operation. We apologize over the noisy generator, we have moved the generator farther away from the cottages. The cottage you were staying are now quite at night time. Thank you for recommending Daroyen Village. Please let us know when you plan a return visit as we would love to welcome you back. We were two friends staying at daroyen village with a package of 9 dives and 5 nights. We really enjoyed our time there.bthe diving spots were amazing and our dive guide, Methos was really cool. He showed us menu underwater life and had a really good time with him under the water. We also had really good moments with him and with Haja on the trips that we made woth them as piaynemo, pasir timbul and other different places that we visited with them. Is very easy to contact them because of the quick response through email with Yohanes. We felt at home with this amazing family so we really recommend this place to enjoy raja ampat. Thank you so much for your amazing review of Daroyen Village. We are happy to hear you felt at home. Your feedback has been passed on to Haja and thrilled to hear that you appreciated his service. Here at Daroyen Village, we do our best for guests to dive all must go to dive sites and visit interesting places. We look forward to seeing you back for more diving! I was with four friends from Singapore that one day had stupid idea to book dive packages in Raja Ampat at guesthouse accommodation instead of luxury resort (our comfort zone). We just picked randomly and went crazy booked one week diving. We contacted them and the respond rate is really fast. We honestly didn’t expect a lot from this place. To our surprise, they are very professional end to end. Something very rare to see with local businesses. The pick up and transfer arrangement is smooth, food is good, and the real highlights is their dive operation. Daroyen is a small accommodation yet they have two industrial dive compressors, boats, tanks, safety equipment, etc. We only expect this from luxury resort, but here we are in the middle of nowhere and they have full set up dive centre. They don’t have special room for camera but they have huge table in the common area that is also dining room area just for camera. The dive trip is on time most of the time. There were few times we are late because we overslept (sorry…). They have briefing and the guide works really hard underwater finding objects. The overall services is really good for a small scale native run business. The family understand what service is all about and everyone work hard. In the morning, the father will go out fishing and return in late afternoon. Somedays the boat return with loads of fish and somedays only few but we always have fish. We also met a couple of local tourists that already complaining on their first day about water, boats, bungalows and worse they compare it with resorts facilities. I think that people should really educated themselves, set their expectation and must have certain mentality when they come to place such as this. This is what ecotourism all about, you take part in marine conservation by supporting local economy. What we thought stupid idea going out of our comfort zone turn out to be eye opener. There were hiccups here and there but that is really normal when you are on holiday, after all this is Papua. Daroyen Village have earned our trust through their hardwork and go beyond expectation. Thank you for visiting us. We looking forward for your next visit to Raja Ampat in the near future. A family with big heart and customer service oriented. The homestay is located on a little island on Gam. Absolutely secluded but not isolated. 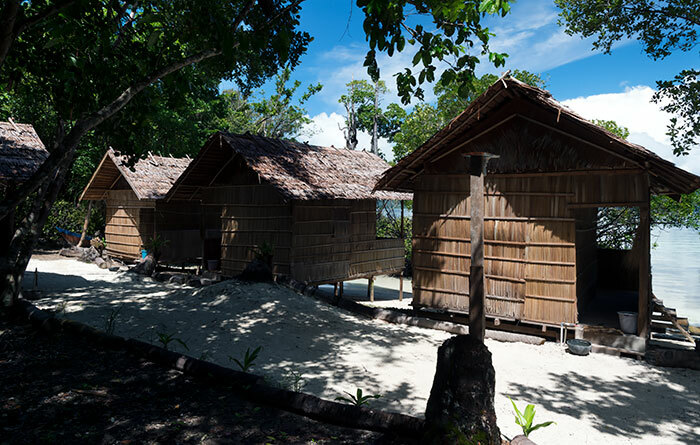 Daroyen Village have their own small beach meaning no tourists from other homestay passing through in front of your bungalows and offer better privacy. I like this place because its a perfect getaway from crowds. Diving is perfection, as many already said in the reviews. 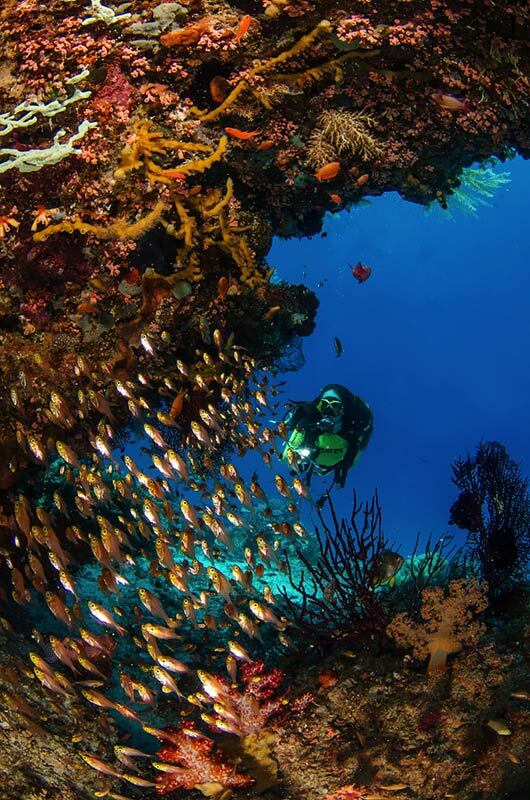 There are no bad dive sites in Raja Ampat. Their guide Alvian is a former liveaboard and very experience. We always feel safe. Overall service is basic but that is the whole point. It is exactly what they offers in their website. To step away from daily routine and learn to live with nature. + Yohanes replies emails diligently prior to trip. Always reassuring when you travel to remote places like Raja Ampat. + Haja and Herman are hospitable hosts and they always try to accommodate to your needs as much as they can. + Diving equipment are in good conditions. Air is good. Guide/crew is good. Emergency oxygen is available on boat. Daily dive planning and briefing is good. + Electricity runs for 10-12 hours starting from 6/7pm. Generator is away from the rooms and did not disturb my stay. + Water/coffee/tea is available for free. 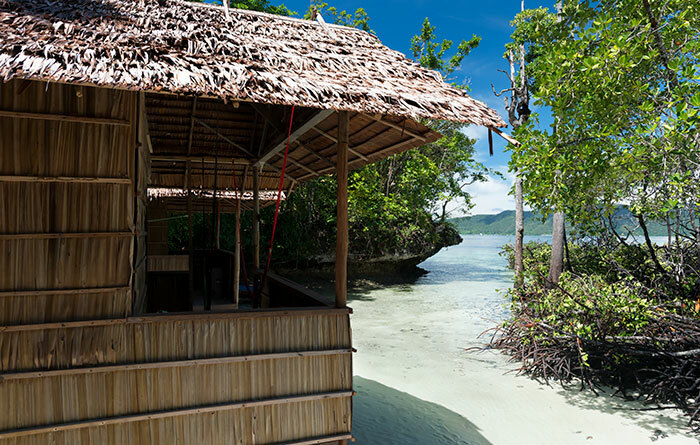 + Airport pickup at Sorong is included. Had no problems. – Room lacks air circulation and is very warm even at nights. Sleeping in hammock outside room is much cooler. – Lack of fresh water for shower. I was their second guest since they moved. They have not found any fresh water source yet at new location. – The new location is subpar. Their old location seems to be nicer with white sandy beach and is much closer to the dive spots. – The small beach is located behind some mangroves. Sea view from room is obstructed. – Toilet cleanliness can be improved. * THEY HAVE MOVED LOCATION! They are now located in Gam island. Not Kri Island. * Everything is very basic including service. Helps to set your expectation right. * Sunday is sabbath for the family. No activities/trips. * Meals include mix of: rice, fish, vegetables, eggs, beans, fruits. Do not expect any other meat. Genuine hospitable hosts who will try their best to make your stay enjoyable. They run good dive operations too. It is quite unfortunate that they have to move location to Gam island. Hopefully they will fix the fresh water supply soon. 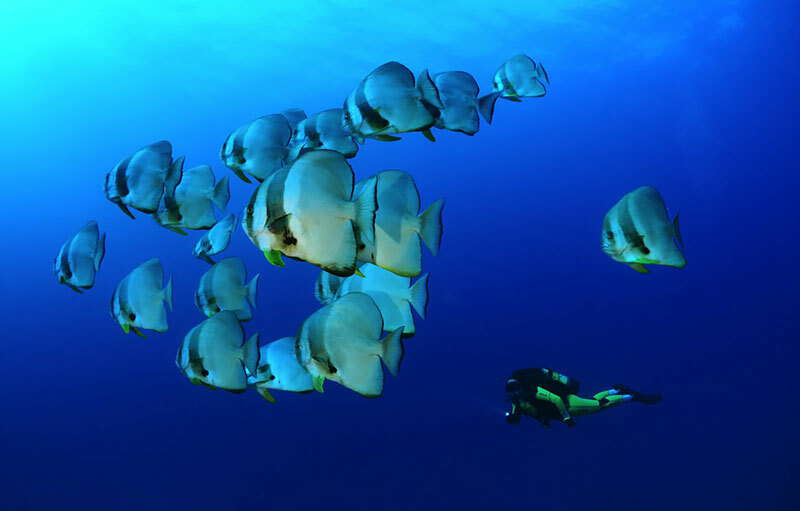 IF you are simply there to dive the underwater heaven and are on a budget, check this place out. You get what you pay for. The old location don’t have fresh water either. Fresh water are not available on Kri island. 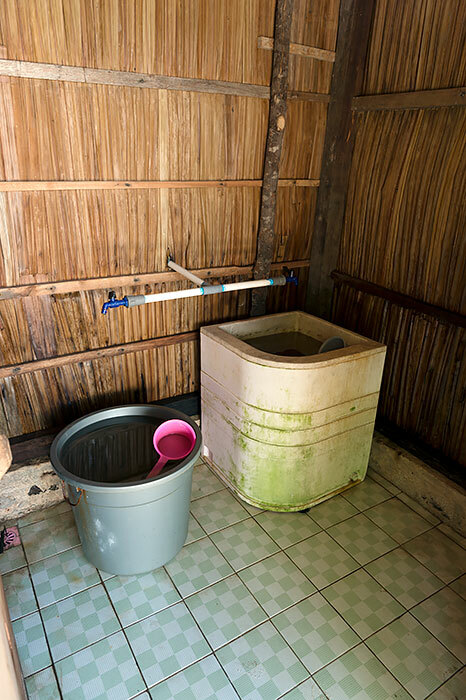 All homestays in that area only have access to water than contain sea water for bath and to wash their equipment. Our new location is closer to the fresh water and we will be bringing fresh water soon from the main island of Gam. We were recently moved at the time you arrive and have not yet finished the fresh water well. I apologize for that. You will have fresh water next time you visit. Other guests have mentioned about the mangroves as well. We have trimmed the Mangroves to clear some view to the sea prior you leave. The view is now less obstructed. Unfortunately, we can not cut down the mangroves because it protected the beach from bad weather, erosion and prevent salt water from entering Sawinggrai village’s fresh water well. 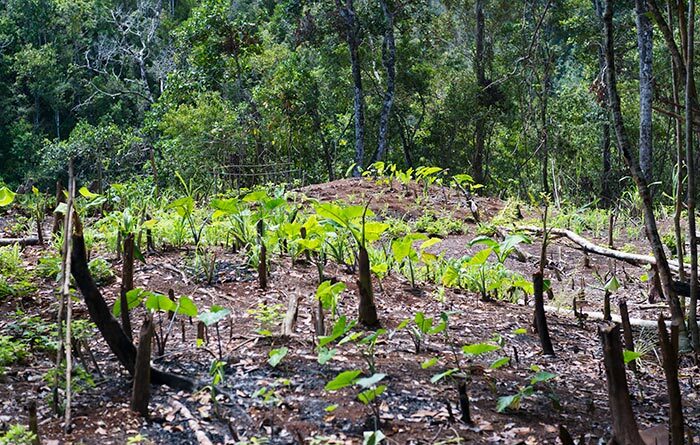 One of our main goal is environment preservation and nature conservation comes first. Room feel warm at night. Unfortunately this is due to the weather at the time of your visit. We will put little fans in the room. Thank you for the input on the toilet cleanliness. we will make sure it will be always clean at all time. The old location is unfortunately getting crowded with homestays each year, the beach is no longer feel private and secluded. In this new location, we have a great opportunity to manage the area and help to save the beach. Already the sand have return slowly. We hope the beach will be back to normal again as in old time. Thank you again for spending time to write such details review. We hope you will visit us again. A five stars because we encounter Dugong. Not once or twice, but 4 days in a row. We even saw a Dugong mother with its pup. We sent email to ask questions and Yohanes reply promptly. He is very patience eventhough we asked a lot. Our obsession is to see Dugong. He explained that they can not promise Dugong sighting because its very rare and we probably won’t be able to see it. Which we understand and accept. They don’t want to sell what they can not deliver. The food is delicious and more than enough for everyone. Menu is always variety of fish, vegetable, and rice. You will not go hungry in this place. If you feel the food is not enough, just ask for more. Homestay is clean. We don’t see any rats. There are some organic debris on the beach but that is very normal. The house reef is really unique. Its worth to dive in this spot. We see manta rays and eagle rays passing through, bumphead, sharks, turtle, nudibranch, frog fish, stone fish, barracuda, etc. In our opinion, Gam island is underrated. Its not crowded with homestays such as Kri and has much to offer in term of marine biodiversity. We highly recommend it. A homestay managed by a modest family that emphasize on good service and guests experience. First, thank you for your visits. We are also happy that we able to show you Dugong. Its the most challenging request we had encounter. Dugong are difficult because they are very shy and don’t like noises. Some divers only managed to see their tails from the boat before disappear and very few divers have spotted them. Gam island is one of the best location for the sighting but we can never guarantee because of the rareness. Thank you again for your kind words. We look forward to welcoming you back on another great stay. The bungalows are really basic but on the beach. There is a common bathroom and toilet. Bathroom has big buckets of water. You use the bucket to pour fresh water over yourself to shower. We kinda knew what to expect but still a bit surprised upon arrival when we saw this, because we are used to with luxurious resorts and liveaboard. But after a few hours of rest, we feel completely OK. Because you are on your own little private beach beach, surrounded by mangroves and unspoiled crystal clear with water in front of your bungalow. As their website (www.daroyenvillage.com) suggested, experience Nature and you’ll be rewarded. The food is tasty Indonesia dishes mostly consist of fresh caught fish, vegetables, and rice cook in various ways. No menu, you eat what they serve but you will not be dissapointed. The dive sites are the best. Abundant coulourfull corals, species of fish, mantas, turtles, sharks, its mind blowing. 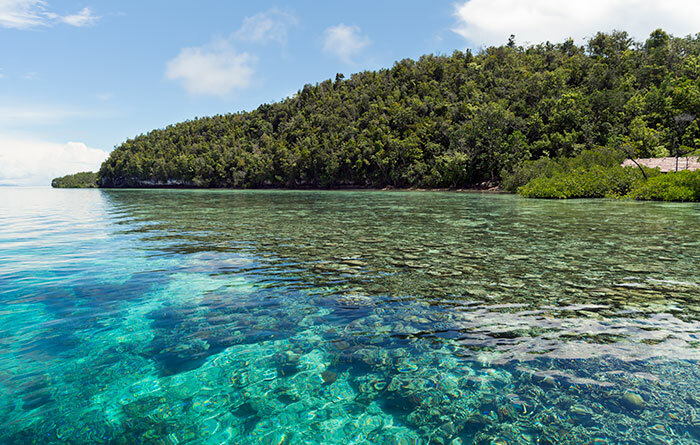 Raja Ampat never cease to amaze us. The best thing about this place is the diving. We go diving in a small group of four people but most of the time just two of us with a guide. At the sites that are known for strong currents, the guide will first check current then brief us or go to another site. The dive boat has its FirstAid kit and O2 emergency. This was our third time visiting Raja Ampat but the first time stay at accommodation run by local people and we feel so lucky to find this place. Its not a resort but the family really care and try to do their best to make your stay comfortable. We will definitely back next year. PS. thank you for stayrajaampat.com. Great website! hopefully more divers put trusts to local run dive centre such as this. Thank you very much for sharing your wonderful 5 stars review. We are glad to know that you found the new location and services up to your expectations. We are proud and humble to be recognized that way and receive your special praise. Thank you once again and we hope to welcome again. Will give 10 stars if possible. The new location on Gam island is beautiful. Its a combination of mangrove and sandy beach. What can I say about the homestay….clean bungalow, good food and most important of all clean bathroom. The family really work hard and service oriented. They’ll do anything possible to make us feel comfortable. Diving is world class. House reef is one of the best we have ever seen. Lots of fish big & small. lots of critters too such as nudibranch, sea horse, frog fish. We rarely see all that in one dive. Too bad we don’t have our camera with us. Thank you for the kind words. We are very touched by your positive comments about our service and the dives. Yes, please bring camera next time and share your photos with all of us. We all look forward welcoming you again. Booked to stay at Daroyen Village at the end of March 2017 but they were in the process of moving their village to Gam. We stayed next door which was lovely and did our snorkeling trips with Daroyen. Might be a good idea to check the current situation by phone or email before booking. Cannot rate our stay but trust that this review will be removed once this listing has been updated. Thanks for the update Steven. That’s certainly unexpected: They only just got settled in at their current location after moving late in 2016! We’ve spoken to Daroyen and have updated this page with all the info currently available. We’ll update the photos and any other info as soon as possible. My girl friend and I stayed at Daroyen Village during Apr 1-6, 2017. Thanks for all staffs. We had an amazing vacation there. The room/food is quite basic, but they arranged diving & snorkeling very well. My girl friend took snorkeling, and I went diving. We went to almost every famous dive sites in central Raja Ampat region. Even only me went diving, we still went to some dive sites far away from Kri. Besides dive guide, there is also 1 staff snorkeling with my girl friend. And they would always check current on the surface before diving. Guide Alvin is very experience, I enjoyed diving so much! They provided rental gears, but it’s short in size. I suggest to go there w your own gears. If not, it would be better to make sure with them first. My girl friend only took snorkeling and still saw so many special fish!! She saw Bumphead parrotfish, Napoleon, reef shark, sea turtle, even manta ray. Also saw Wobbegong Shark during snorkeling!!!!! And Herman found 2 walking sharks for us, just at beach in front of room. RA is a really amazing place!! I will go back to there definitely! Myself and my wife stayed with Herman and his lovely family for about two weeks in February at Daroyen Village. We had a wonderful time and I thoroughly recommend his homestay. We were there principally to dive and all I can say is that this has to be the best diving in the world. Fredy and Alvin were great dive guides. You just had to say what you were interested in and they would find it for you. The coral is in fantastic shape and there are more fish and small critters than you can possibly imagine. You can access a huge number of dive sites via short boat rides from the homestay enabling you to do 3 dives a day plus a night dive if you so wish. The equipment is well-maintained and the boat crew are excellent. Snorkeling is great , too. It is a small, quiet resort which is just what we wanted. 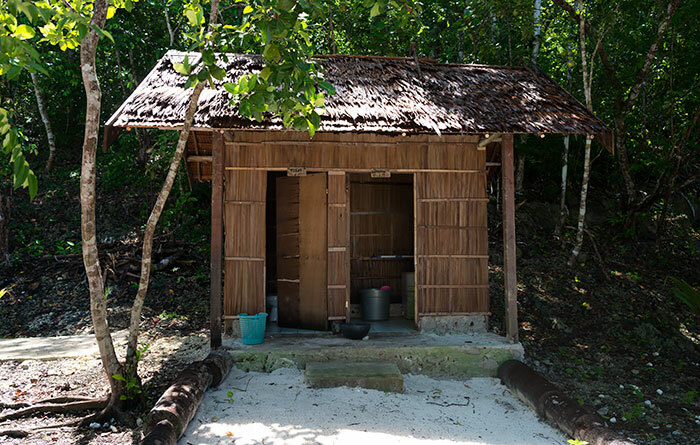 The bungalows are simple and the shower and toilet facilities are fine. But don’t come here if you are expecting luxury. The food is simple and the family will try to accommodate all your requests. We brought along a lot of our favorite snacks just for a bit of variation. We gave generous tips to each of the kitchen and diving staff individually and I encourage you to do the same to ensure each person receives an appropriate share. We look forward to returning some day, hopefully sooner rather than later. House reef near the homestay is really amazing. Every time snorkelling there you see black tipped sharks, turtles, napoleons, sometime big schools of bump heads parrotfishes and a lot of small fishes, like for example pinnate batfishes. Younkoranu (nearby homestay, 150 meters from Mambrasar) have a bit better location for snorkeling because of its jetty which is in the middle of the most interesting part of the reef, but it’s not a big problem to have a 15-minutes snorkelling towards this jetty. And of course walking sharks near the beach are amazing! Diving was also very good – we saw a lot of interesting things. However, dive guides are not very experienced (they are good as dive masters, but do not show you a lot of interesting things under the water). The guesthouse is really small, so you can choose where you want to go. Accommodation is very good, you have everything what you need to stay. Big houses, some of them are with a toilet, in some a toilet is outside. Big bed with mosquito net on it, and not very salty water in “shower”. Food is tasty, but do not expect to have a big diversity: on breakfast usually you will have very tasty cake, fried bananas or pancakes and on lunch/dinner rice with fish and some hot vegetables. We had really amazing vacation, for sure will come back to Raja Ampat once again and highly recommend to stay in this guesthouse if you are looking for good (but not luxury) accommodation and good diving/snorkeling. Thank you for the positive review and the overall value you experienced during your stay. Your description of our strategic location, perfectly located near great dive sites and snorkeling area is high commendation. Thank you for sharing this review and hope to see you again for another great stay with Daroyen Village. very nice and friendly hosts and crew. Always helpful and cooperative to make their best for the guests. Beautiful location by the sea with a lovely view. Nice and simple cabins, quiet efficient for a comfortable stay. Very very good dives. Guests are free to choose the dive sites and all good sites are covered. Owner is a very experienced diver himself and cares strongly about safety. will be happy to go back. Its a really great pleasure to know that you enjoyed the stays. We appreciate you positively mentioning our location, cabins, and the dives. . Looking forward to welcome you for your next stay with Daroyen Village so that you can explore more dive sites. we was two times in Dayroen Village and old Mambrasar. the service and the food are realy good. also diving we can choose our own dive spots because we was only two divers in this time. the bungalows are ok but not all have a bed. we dont have any animals in our rooom. its important dont bring food in your room. the location is for us perfect. nice beach few minutes walk to jetty during low tide, high tide your foots getting wet but its always possible. we enjoed our vacation by hermans family with diving , snorkelling, relaxing and explore the island of kri. if you know what is a homestay ,this place is great homestay. we recommended this place and we will back again. Thank you for choosing us again for the second time you visit Raja Ampat. We are glad that you like our new locations and bungalows. . We are all looking forward to welcoming you back real soon. Wonderfull homestay and the most autentic place in kri island!! The dives are beautiful !we must to have good level for apreciate it. All the team make their best for you! We stay 10 days and it was a fantastic experience . We hope to go back there one day!! Tahk you a lot ! We are really thankful for your glowing review. We appreciate your comment on our simple accommodation experience and glad that Raja Ampat have met your scuba diving expectation. We hope for the opportunity to welcome you again for more enjoyable stay. I spent two weeks here in 2016 and had the most fantastic time. Exactly what I wanted and what I expected. Awful experience. I can not recommend this place. It is not safe for women, nor for diver. This place needs serious help. We had dangerous troubles with our regulators and all the equipment and instead of changing it, they kept drinking beer and looked grimmy. They did not try to communicate at all with us but always decided weird stuff without explaining, so was my rented bcd not on the boat one day, just a way too big one, we had briefings for divesites and before going on the boat next day with no reason they announced another place and sometimes divemasters didn’t show up but we were only told after one hour of waiting in the morning. Bubbles out of the tanks and hoes and regulators was normal. Twice we had two regulators with two broken membranes during the whole dive. Don’t dive here. We also got harassed while already sleeping in our bed and at night they called us out to see a wobbegong shark, we went to watch but they kept picking that poor creature out of the water with their hands and its heart was racing wild, my boyfriend got really angry, it was sad to see. Ten people complained after six days of only cake for breakfast. Other places always change from cake to fried bananas and fresh fruit but here only cake even if it was no problem to fry some bananas as they were sitting around anyways. It seems like they really didn’t care at all about guests. We didn’t feel welcomed. I’m sorry to hear you did not like our place. I just want to clarify few things you mention here. The only problem you had with equipment is the mouthpiece that leaked. We quickly replaced with new mouthpiece. Our regulators are equipped with spare 2nd stage regulator (Octopus) for this kind of situation. You can easily switch to Octopus in case things like this happen again. You said we did not try to communicate but always decided weird stuff without explaining. Just want to explain the BCD issue, we don’t have BCD that fits. So we have to rent from other place. One day, the owner of the BCD need it back for just one day and will return it back the next day. So we spoke with you and your boyfriend and he said its fine you will wear the other BCD for that one day. We did ask a permission. I’m sorry this was not clearly communicate to you. You said the divemasters didn’t show up but only told after one hour of waiting in the morning. This is hard to believe, you dived everyday with guide. In our record, there was one day where we have to switch guide but we still went out to dive. Perhaps what you meant is on Sunday. You dived at 2pm and 4pm. The custom in Raja Ampat is no activity on Sunday. Sunday is a church day. In order to accommodate guests request and still respect the village custom we have the activity later after the church. We are the only homestay in the area that still have diving activity on Sunday. The one person that drinking beers was warn and let go, he no longer with us. We have strict policy no beers while we have guests. I understand your dissapointment but I think is very harsh to accuse us all drinking beers and doing nothing and all equipment are dangerous. I also need to mention that you were never charge with equipment rent either. Daroyen Village is a result of years struggle and hard work. We realize there are many aspects we can improve and we work on those issues everyday. Once again, we are truly sorry please feel free to contact us. because we love Raja Ampat and because we have extremely good experiance with Mambrasar homestay and Mayor family year before, we decide to visit them again but this time even with bigger group of 17 divers. We are made more than 20 dives in 10 days and every day we had half day or full day trips to the must see places around area. From Pulau Fam to the Kabuy Bay and all around Pulau Gam and rest of islands on the path. After our ten days staying at new Mambrasar homestay we’ve moved for five days to the Bunaken Island and five days to the Lembeh Island. All friends from group can tell that our time at R4 was most beautiful in comparation with Bunaken and Lembeh. Pristine waters and still richest coral reefs with mindblowing underwater life in combination with realy reliable and trusty family/owners who run well organised homestay far away from people and any kind of polution. Once again I will repeat that I see Big improvement inside and around new Mambrasar homestay in all segments. Bigger, better & more beautiful. They are also already rename homestay in Dorayen Village so Mambrasar doesn’t exist more. We will be back again for sure because they give the best they can do and because we don’t have any problems or complains with our first and second diving expeditions to the Raja Ampat. Many thanks to Mayor family because they make our dreams came true. We stayed in Mambrasar after venturing Arborek and Gam. Mambrasar look nice and the foods and the service was very good. We tried the diving and it was professional. We enjoyed the beach in front if the guesthouse. The only complain I would have would be that our bed was smelly. Other guest said that the inn was quite full and we might get the room which usually not given to a guest and maybe the pillow sheet was not changed or maybe the pillor itself was smelling like sweat. Note: dont bring food into the room. The rats are quite aggressive. I noted some of my raja ampat experience in my blog maikamondlicht.blogspot.com might be useful for those who want to go. Thank you for the reivew. We have had a similar complain through email in regards to the the bed and pillow as well and responded several months ago. I can’t remember when and was wondering if it was you? Apparently after further investigating the problem, the odour and the moist you felt are from the mattras and pillows that are still new. The factory before they wrap mattras, pillows in plastic bag will add something to prevent any harmful bacteria grow in case there is a damage in packaging during the shipment. The moist and the smell will eventually disappear overtime and it will be just like any mattrass and pillows. We wish we had learned this earlier. I assure you that no homestays on Kri island will dare to use dirty sheets and risk damage to the homestay association reputation. Thank you again for spending time to write this review. We hope welcoming you back in the future and that you will find our current new bungalows are much nicer. Thank you for the really great review. Its a great pleasure when guests satisfied despite our simple accommodation. We have just recently moved to new place at Kri, you can find the photos here posted by Stay Raja Ampat who have been so kind to take time off to visit us just to take photos of the new location. Again, thank you for your visit and we hope we will welcome you again in near future. I definetly recommend Mambrasar Guesthouse!! We are a couple from Barcelona (35 years old) and just came back from Raja Ampat. We were 6 nights there and it was great! You can do amazing snorkel just in front of the guesthouse. Tourtles, sharks and many many fish and coral. They have now 2 new bungalows with private bathroom. We took one of those but they have also bungalows with shared bathroom for lower budgets. Haja, Herman, Yohanes, Noak and all the family are really nice people. They live just there and they will help you with anything you need. Every day they took us snorkeling in a different place for very reasonable price. We don’t dive but other guests did. You can dive or snorkeling, its up to you, just need to ask them!! The food is good and very abundant. Hope we can come back there some day. Thank you for everything!!! Thank you for the glowing review. We really glad we can help and make sure you enjoy the stays at our new location. 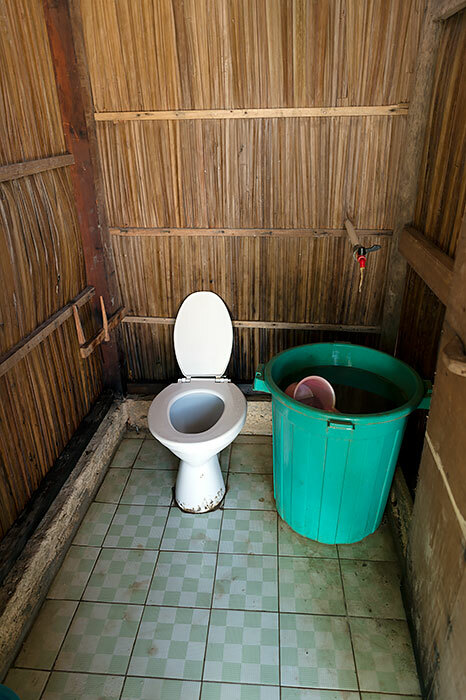 Our plan in the future is to have all bungalows equipped with private bathrooms. We hope welcoming you back in the future. This was our first travel to Raja Ampat. We looked for a local homestay and finally decided to go to Mambrasar due to the good reviews on internet. We have to say that we really enjoyed our stay with this friendly family, who are so concerned about the welfare of the guests. We also made dive for 4 days, and although there were not the best season to see mantas, we had nice expiriences on dives with strong current and amazing corals and big stuff. Underwater world in Raja Ampat is much good than you can imagine. We want to thanks Haja and Herman and all your family, because we’ll remember this stay like one of the best places we have ever been. We’ll sure recomend our friends to come to Raja Ampat and stay in Mambrasar Guesthouse. A very good choice: Mambrasar guesthouse. It was my first time to Raja Ampat (and I will go back there), so it was difficult to select a island and guesthouse. Based on the location, diving direct available at the guesthouse and the review I selected Mambrasar. Even at the first contact I was pleased with the quick response (and in good English) and booked my stay (also paying the deposit with paypall is going very good). Arrived I was welcomed by people at Mambrasar and they whole week they were very friendly and willing to help. For a guesthouse the service was quite well, with the available food they prepared nice meals (most of the time it was with fish, sometimes egg, but I like fish so for me it was good). There was always fresh drinking water, coffee and tea available. One tip: have one of two empty plastic bottles with you to fill, to take water with you on the boot with diving. Even they take hot water for tea and coffee with them on the boat to drink in the break between two dives. If you take telcomsell sim card, you will even access to internet with your mobile (be aware it can be down sometimes for some time).Diving was amazing (thanx to Jerry). I had 14 dives and each one was on the direct reef, the reefs are huge, a lot of coral, very much sealife and very good visibility. The marine life is very divers from small nice nudibranches to turtles and black tip sharks on most every dive. With some luck you see the wobbegong shark (I saw two).I like to thank the staff of Mambrasar guesthouse again for their hospitality and good service. Special thanks to Haja and Herman forbthe service at the guest house, Johannes for the e-mail contact and Jerry for the dives. If I come back to Raja Ampat again, then I am sure to stay there again. Mambrasar guesthouse was my little paradise located on the island of Mansuar about 30 minutes boat ride from Waisai Port. With so many guesthouse & homestays to choose from I find that this guesthouse is located right smack in the middle of the top dive sites in Raja Ampat being Sardines, Chicken, New & Blue Magic Reef. Food was acceptable although I wish them to be more spicy but portioning was plentiful. Pak Herman & his lovely family live onsite & Freddy was a fantastic dive guide – make sure you ask for him for your trips. The bookings process was smooth – Yohannes responded to my inquiries diligently & promptly & had helped so much to ease my anxiety to travel to this remote place. The rest of the staff especially Pak Hajar were very soft spoken & attended to my request promptly. They even offer full service from pick-up from the Sorong airport to Sorong Port & pick-up from Waisai Port to the Guesthouse. Apparently they’ve shifted to Mansuar Island for one week I was lucky to be their very first guest. 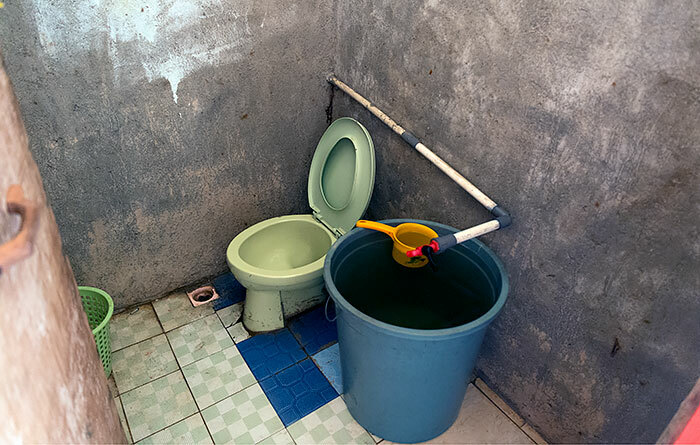 The new place is basic with western toilets, no fans in rooms & a well for the freshwater source although you can still taste the saltwater BUT if you don’t mind this then you should have a fantastic stay. There’s not much to do on Mansuar except to eat, dive & sleep. If you don’t mind basic accommodation then I would highly recommend Mambrasar. My 5 nights trip wasn’t enough to cover all the great dive sites BUT I had a awesome stay and would definitely plan another longer trips there. Overall I was very pleased with the trip. Thank you for the glowing review. We are really glad you enjoyed the stay. Its not possible to cover all sites in Raja Ampat in one life time but we try to cover the best sites as many as possible. We look forward to welcoming you back in the near future. We are a couple of freedivers and we really enjoyed the underwater world. You won’t see so many healthy corals in the Red Sea and as you probably know the marine biodiversity is one the highest in the world here. It’s probably one of the best places to free/dive in the world. Beautiful location, great beach and the best freediving/snorkelling site out of all three in our opinion. The beach has only a few homestays and there was hardly anyone there during our stay. 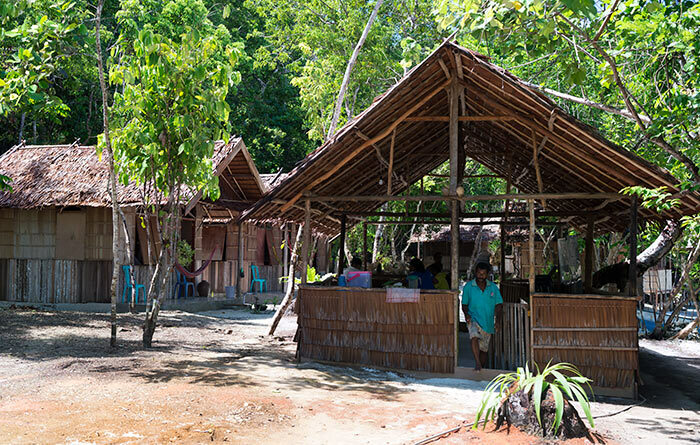 There’s also the Raja Ampat Biodiversity Resort down the beach but don’t go there – they weren’t very friendly (at least the guy – divemaster we met). VERY expensive beer and they try to be a bit posh. The owner of Monkairi, Boni, pissed us off I have to say. When we arrived we had no idea about the prices and he offered us absolutely ridiculous price for a trip to Manta Sandy. Also other trips we were very expensive in retrospect. Our impression was that he was kind but didn’t want to work much and wanted to squeeze you for your money, you rich Westerner. But he showed us birds of paradise which was nice. He did try to give us some experiences. The food was good but a bit repetitive. But the fresh fish they served were absolutely fabulous. The quality of mattress was probably the worst out of all three. Although the page says there’s an English speaking staff member it’s not true. No one speaks English at Monkairi. So you better learn some basic Bahasa Indonesia words. The family is nice, we loved the kids. All in all a fine experience but not without some downsides. A very different experience compared to Monkairi. Located on a looong beach with MANY homestays. There were a lot of people on the beach. It was the closest experience to going to Thailand or a similar place. Great thing about Mambrasar is that they speak English pretty well and they organize diving trips. We joined a scuba diver and went to all sorts of diving trips almost every day – also for a good price. That was great. Other than that – not much. The quality of sleep was terrible because they kept the light on all night long. Why? Because of rats. Yes, they were right in the bungalows. Food was fine although much better at the beginning of our stay than after a few days. And there’s not really much to do there. There’s no real place where you can rest during the day, no hammocks or stuff like that. The house reef we didn’t like that much. But if you walk about 700 meters then you arrive at a very nice reef to explore. The staff was nice and helpful. They also organised a trip to Wayag for a pretty good price. All in all also a fine experienced mainly because we enjoyed the diving trips. The best homestay we experienced. It’s VERY remote – basically you’re on your own on a small island. No one near except for the owners. It’s very nice when you know it and expect it – when you actually have stuff to do. The owners were very nice and helpful, they really tried to give a great experience. The housereef is ok and it’s home to Dugongs which we saw. There was on major downside though – there were TONS of mosquitos. And no repellents. 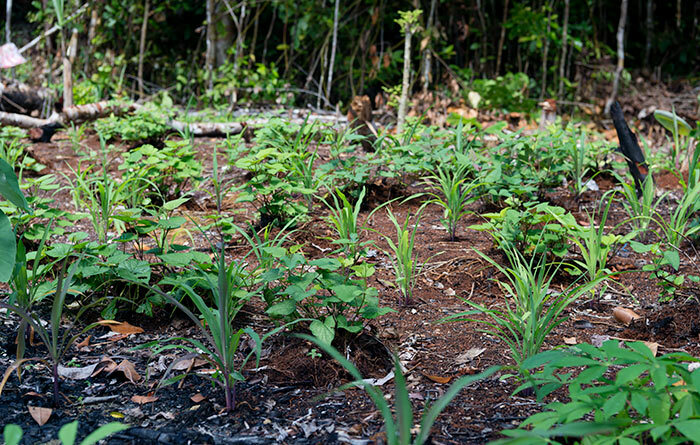 We didn’t expect that many of them and we had only a small bottle of natural repellent – and it simply didn’t work. Honestly it ruined our stay. Because in the morning and in the evening all you could do is stay in the bed behind the mosquito net – you couldn’t be outside. During the day it was fine. Had we had it it would’ve been fine altogether. The food was fine although pretty repetitive and very often we got donuts for breakfast. You don’t go to Raja Ampat to eat donuts with lots of sugar I think. The quality of sleep was the best out of the three – a very nice mattress. As I said it’s very isolated so bring stuff to do. After a few weeks you won’t want to be in the sea all day. And don’t expect many trips either. All in all we enjoyed it mainly because of the owners and their attitude. It was the best place out of the three for us. 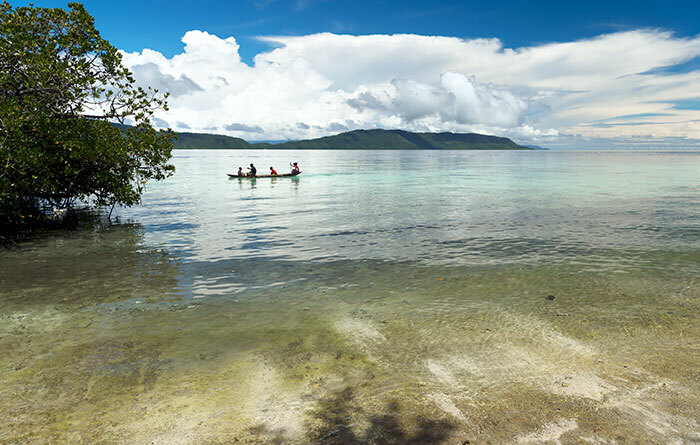 Great experience, beatiful location, amazing reef, wonderful food, friendly and kind local people… Don´t know what else can you expect if you want holidays in an authentic destination in west Papua. Booking in Mambrasar was very easy, tha answer was almost inmediate and the pay pal payment a very convenient option. It´s a bit hard to decide between so many guesthouses, so if you need to go for a sure bet, Mambrasar is a very good option. Our stay at Mambrasar for a week (end of April – beginning of May) was awesome! Wonderful food (fresh, tasty and more than enough for all quests), lovely dogs, amazing diving (28 dives for 2 of us) and true hospitality of Herman and his family. Booking was very smooth and easy with quick and detailed replies from Yohanes, boat transfers to/from Waisai and diving trips safe and comfortable under constant Herman’s control. All guesthouse facilities are correctly described above and they totally met our expectations (couple of nights I was dreaming of a ceiling fan as there was no breeze, but that’s not a big deal really). Our diving trips were lead by Dany and I want to thank him separately for his sharp eye taking into account limited visibility we experienced. On the other hand with all that plankton we were lucky to see mantas several times! With all the diversity Kri and other islands nearby can offer over and underwater you will enjoy every minute of your stay at Mambrasar. There are some bigger and more modern guesthouses on the same side of Kri, but we enjoyed natural living and privacy of Mambrasar. If you require some beer, soft drinks or snacks – couple of homestays sell those. The only complaint we have – the Sorong airport/ferry harbor transfer! Not reliable as previous guests mentioned already. :( In our case Yerry was 30 minutes late for airport pick-up on our way to Mambrasar (our arrival time was provided to Yohanes in advance), and on our departure we again spent more than half an hour waiting near ferry ticketing office and finally used yellow minibus to get to the airport. Probably miscommunication between Yohanes and Yerry, but not very pleasant experience. I hope that Herman will fix this issue soon in order not to destroy the positive impression most guests have from their stay. In general I would certainly recommend Mambrasar guest house. Once again thanks to Herman and his team! Wish you all further development, success and prosperity! We have been in Mambrasar homestay 1 week last april. We enjoyed a lot our stay here, amazing place with lovely people. The facilities are just like you can see in the photos, simple but enougth to spend some days in the paradise :) . We booked our stay in Mambrasar via email. Yohanes answered all our questions promptly. The food was incredible. We have big quantities (so big that even we could’nt finish them!) and variety. For breakfast really nice cakes and coco nut crepes and for lunch and dinner, fish, vegeteables, eggs, and good fruits. Mambrassar’s food was our favourite in Indonesia, really home made and natural. We are CMAS level 1. We have dived just 2 times in the sea before coming to Mambrasar. We have explained our situation to Mambrasar’s team, because we wanted to begin slowly and in places withouts currents. Our guide for all our dives was Danny. Really nice guy who helped us to discover all the wonderful flora and fauna in the area. We spent a nice time diving with him. He has good eyes to find animals, and he knows well the spots. We want to thanks Herman and all his family, they took care of us in our stay. they were really open-minded with all our needs. Before visiting Kri island we did’nt know what homestay to choose, but now we recommend mambrasar with no doutbs. Only one downside, the taxi service from Sorong Airport to the Harbour was unreliable for our round trip. During booking time, Yohanes replied in a very kind manner to all our questions. We stayed there 5 nights, snorkelling only. The sea in front of the guesthouse is just amazing! Snorkelling equipment is adequate. The staff is nice and helpful, when you ask something. We also had a problem and they brought us to Waisai at the last minute request! Food was delicious and abundant and we always ate everything in order to thank them. The bungalows were nice and as you can imagine there are rats and a lot of humidity, but we are not sure that they can do something about this…you choose to be there in the wild. In our opinion, because of the humidity and the warmth by night, it would be better to wash the pillow cases more often. Maybe paying attention to small details like replacing light bulbs or toilet papers or tidying up the whole area could make the difference. We do not want to criticize but only give an input for the next season. Thank you for this review of your recent stay. We appreciate your feedback on the pillow case and small details. We will pay attention to these. We booked our stay at Mambrasar just 2 weeks before our trip and were very impressed with how quickly the responses came and how helpful they were – thanks to Yohanes for guiding us through the necessary arrangements and processes! Pick up at Sorong (from airport) and Waisai (from pier) went smoothly despite last minute changes with our flights (long story), and the ride back to homestay with Herman went smoothly. We really enjoyed our stay here (hence the 5 starfish), the accommodation is very basic, but the food were tasty for all meals – having read other reviews we were a bit nervous about this and brought a lot of ‘in case’ food which were useful (especially energy bars for between dives), but probably not vitally necessary. The divings were really spectacular. We enjoyed our dive guide, Alvin, a whole lot and really appreciated how he’s very careful about the environment in which we dived in. Marianne already went into details about how he dealt with us and other divers at Manta Slope, so I won’t go into it. Our top dives have to include: Manta Slope/Sandy/etc., Chicken Reef, Cape Kri, and also Yenbuba jetty. I agree with Marianne that dive briefing were inconsistent (probably because Herman’s brother who normally does it were away), but we felt they were always willing to accommodate our wishes when possible – which sites, etc. We also really enjoyed meeting other divers there – the lack of seating areas rather made us all gather in the dining area. However, bringing a hammock was a great idea (and I understand the homestay are also considering putting in 5-6 hammocks of their own too). Yes, they are rats. Just take care of where you keep your food and you will be fine. It’s just part of the wild nature :) Usually when something is amiss (not enough water in the bathroom, needing extra bowls, etc.) all the staff had been very accommodating to all requests. We are delighted for your positive review. Your experience and recommendation is shared in the family meeting. Table, chair and hammock are on our list to add, it will take sometimes as we make our own but hopefully all completed by the end of this year. Thank you for taking the time to share your experience with other divers and travelers. We stayed for 5 nights and then returned for an additional three when another homestay did not honor our confirmed booking. :-( Mambrasar welcomed us back and even fed us as we arrived at the dinner hour. Food was tasty and the most varied. The cook is quite skilled. The house reef was fantastic and we snorkeled it day and night when we weren’t diving and had great experiences. Big and diverse fish populations and beautiful coral. Our guides were Noah and Alvin. We really enjoyed Alvin and were impressed with his clear directions on etiquette when we visited the mantas. He lined us all up to view them unobtrusively and when another guide brought his group right into the manta’s path (and a videographer with big lights chased after one), Alvin even gently pulled them back away from the zone. Really nice young guy who could find hidden treasures, watch everyones air and depth, and take care of the reef. We enjoyed kidding with him too. Noah was also great at finding tiny critters, but did odd things like dive with his kit (bc, tank, etc) under his arm, and completely ignore air consumption in the group. He also touched and harassed the entire dive – I was bummed to see him touch the coral constantly and poke fish out of crevices so a photographer could snap a shot. All of his dive profiles seemed to be to drop to 85 feet and work your way up. There wasn’t anything special at depth on those dives, and we wondered why he left so little time for us to spend in the brighter light and more vibrant color of shallower parts of the reef. Nobody ever asked for our C-card or about our experience. Dive briefings were intermittent – sometimes we had them and sometimes not. I was glad to have along my own computer and mask, fins, snorkel. The other gear seemed adequate. We stayed in two different bungalos. One had slats underneath and a pad that barely gave any comfort between our bodies and the thin boards below. The other was on a flat elevated surface with much thicker pads and the bed was by the window so it was much cooler. It also had a table for our stuff inside. There was almost nowhere to sit but the benches in the dining area. Bring a hammock and/or camp chair! If you have a small fan that would make life a lot more comfortable at night too. We saw rats every night and they got into food when given a chance. Hornbills and parrots were around the site and we got very good views of them. We also had bats visiting the flowering trees – watched them with a red light on our headlamp and they were pretty adorable. Friendly dogs – including a puppy that we fell in love with and called Steve. We very much wanted to steal him away but what a great life for a dog to swim and loll in the sand and play with other dogs all day. I hope visitors and the owners will be kind to this smart little pup, he’s a great ambassador greeting and saying goodbyes to visitors and coming by for a belly rub. Much appreciated by these four travelers away from their own pets. The brothers who run this homestay were both great and very helpful. The deckhand/boat driver whose name we never did catch was competent and once we broke the ice, very funny and nice. We really felt like he took care of us and was there to pick us up right away after a dive. This doesn’t feel as much like a homestay because the village is quite a ways away (walkable on a low low tide but we were never sure when our second dive was going to be so we never made the walk). Best house reef we had of the three homestays, and when we returned there after staying elsewhere my husband said he was glad we were going ‘home’ to that reef again. Thank you for your positive review and the 5 stars rating. Food quality is our main concern from day one we opened, we are pleased to hear that you enjoyed food we served. We have shared your review in the family meeting as well as said dive team last night. We take full responsibility and apologize for the unpleasant experience. We will make sure that our guides are more properly brief about divers responsibility. In regards to the dive briefing and credential checks, , going forward we will make sure there will be dive briefing everyday. We will also make sure that guests will be fully inform on when is the second dive. Our dive team are too focused and concern with the actual divers’ skills usually demonstrate in the first dive check than certification and number of dives. 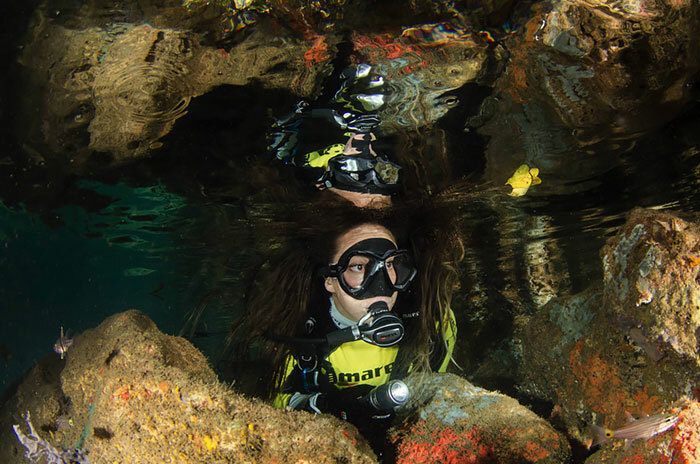 Sometimes divers with entry level have better buoyancy and control, because of this dive group is usually based on the divers skills than certification level. We hear suggestions from our guests and we are working on the upgrade on our facility this year. Hammocks, chairs, and fan in bungalows are on our lists. We should have it completed this before the end of this year. We love our dogs :) as it helped us to control the rodent issue which unfortunately is a problem on Kri island as our location close to the forest and they are part of the wildlife. Thank you for taking the time to review us, please feel free to write any input you may have to info@mambrasarguesthouse.com. We hope we will have a chance to welcome you again. We were a group of 6 and stayed at Mambrasar for 7 nights (7 nights packet with 14 dives) at the end of february. We were offered 20% discount on the package as we were 4+ people. Mambrasar is situated at the end of the beach starting from Yenkoranu, and you can only go further then the small cliff at low tide (or get a bit wet), which means the place is very quiet. The path leading to Lumba lumba is just behind Mambrasar, it takes then around 15 minutes to cross to the other side of the island. Food: we could eat fish at almost every meal and the food was always fresh, tasty, and plentifull. Rooms: Kri homestays standard, basic but clean, mosquito net, multiplugs for gadgets, no fan (I didn’t feel the need but my friends felt a bit too hot). Just do not leave food on the ground as mices and ants will come! Bathrooms: shared, in the back of the group of 6 bungalows. Water is slightly salty, as I guess it is not easy to get freshwater on Kri. For those who need private bathroom, there are bungalows just next door with concrete private bathrooms, but I have been told they get quite hot because of that concrete. Electricity was available every evening/night thanks to the generator, and beyond the announced midnight, so no worries to charge your gadgets in the evening. You go for 2 dives in the morning with the surface interval on some island nearby (mioskon if you dive Blue Magic and/or Sardines/Chicken reef, the sand bank near Sandy Manta …). 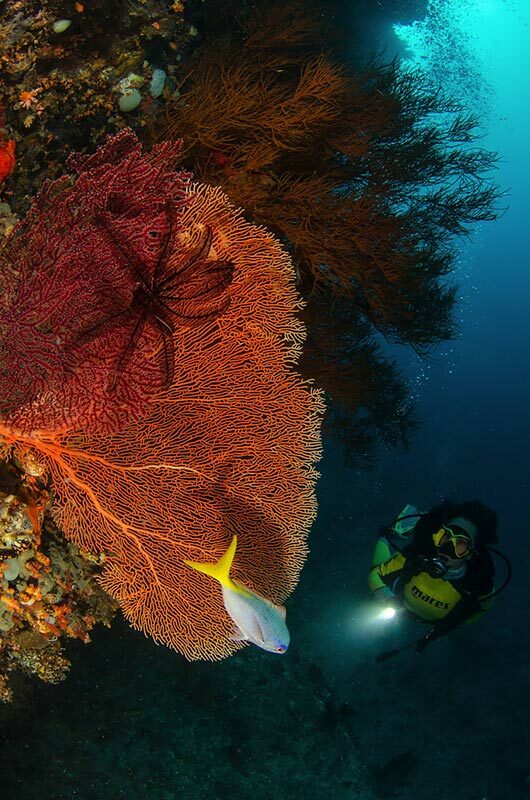 The third dive is local dive on house reef or at Cape Mansuar, it can be arranged as a night dive. It is worth noting that we could choose our dive program beforehand (1 or 2 days before), with advices from the dive team. Special thanks to Yopi, who lead most of our dives. He was very knowledgeable on how to find small critters, and we always felt safe under his guiding. When the current was strong, someone from the team went beforehand to check dive conditions and adjust the boat dropping point. Maybe we could suggest a full pre-dive briefing before getting into the water (dive site topography, dive plan, what to see…), but is it a language barrier issue? Overall, I would be very happy to go back at Mambrasar guesthouse and recommend it to my diver or non-diver friends. I really enjoyed my stay along with Herman family, and dives were the most exciting I ever done. It is feel great to read this wonderful review of your recent stay with us, we are glad that you enjoyed your stay and the dives. Yes, unfortunately all water on Kri island is slightly salty because its a small island. This is also same with other accommodation at Kri from resorts to homestays. For cooking and drinking, we have water transported from our village Yenbuba. We glad you enjoyed the dives. 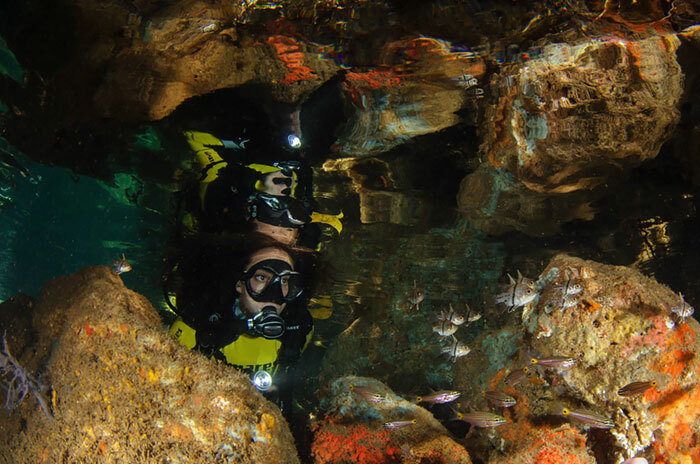 Our dive team is always open for any dive sites suggestions from guests to be included in the dive program.We apologize on the dive briefing that is lack. Your kind recommendation is heard by our dive team and will make sure there will be dive briefing everyday. We hope to welcome you again and when you do, you will find our bungalows are different and even better. Dear Chris and Erika, we are glad that you enjoyed the stayed and the dives. Thank you for sharing the experience and we look forward welcoming you again. I and my girlfriend has a lovely stay at Mambrasar homestay in January 2016. Transfers from/to Waisai were seamless, with no waiting/delay. Although I am certified to dive I much prefer just snorkeling so we spent our week snorkeling all around the coast of Kri. Kri is a small island so really you can easily walk to most of the great snorkeling just off the shore. That said the house reef is quite beautiful and the reef on the other side of the island (Lumba Lumba bay) a 5 min walk over a small hill is spectacular. We saw tons of fish, reef shark and turtles! The small suggestion for improvement is that breakfast tends to be quite light, especially considering you’ll be burning a lot of calories snorkeling and diving. And most of the meals is vegetable and fish, so it can be a little monotonous. So bring energy bars (non packaged foods are not a good idea given animals/insects on island). But overall a very enjoyable stay and we hope to be back before too long! Dear Tenzing, we are glad that you enjoy the stay and thank you again for the valuable input. We will make improvement based on your suggestion. We had a wonderful time at the Mambrasar homestay, with the highlights being the absolutely amazing snorkeling and diving. Herman was helpful arranging for us to go diving on two separate days and making sure that we had all the proper equipment. We saw everything from reef sharks and manta rays to turtles and barracudas, and the list can go on! The snorkeling at the reef right in front of the homestay was also really incredible and you can tell that the family is careful to preserve it. Having the reef right on your doorstep was definitely a big plus! The one downside to our stay was that there seems to be a rodent problem on the island, which made eating dinner a bit unpleasant. This is likely also an issue for other homestays on Kri and it might be a good idea for all the homestays to see if they can solve the problem together. Dear Isabelle, thank you again for your visit. We are glad that you enjoyed the stays. We aware and have been working to find solution with rodent problem. Because they are part of Kri island we need the safest solution. We had try all kinds of traps, glue, and our dog have also involve but they always return. We believe, we will find the best solution for this problem. Awesome sunset, great coconut fruits in the afternoon after snorkeling, friendly pak Herman and Ibu…. convenient laundry by Ibu… happy snorkeling dogs, kids and lovely Mama bird (she will great you three times a day: when getting up in the morning, after lunch and and during sunset. I miss Mama bird so much. so indulged, so nice honeymoon. Accommodation at Mambrasar is better than in other homestays around. Spacious sweet palm leaf bungalows with concret floor and real wooden bed with mosquito net, there is also helpful tables and benches inside rooms and at verandas. 6 bungalows, two toilets and two mandy showers, dinning shelter is spacious with extra tables and two cool boxes. Beach is pure paradise, bring your own hammocks, sea is warm, place is wonderful, sunsets are magnificent. At the north Kri beach near sand bars between Kri and Mansuar in the center of Dampier strait. Behind homestay is location where comes coconut crabs at night. It is nice to walk from Mambrasar to Yenbuba village across amazing sand bars during low tide.There is one small shop in Yenbuba village and at Arborek if you need some extra Sambal and sweets. Every day we had all day long trips with 2 dives around central Raja Ampat. Dive guides are experienced, excelent and safe. They know everything about currents and dive locations and with eagle eyes they will find macro creatures like pygmies and nudies or crabs and shrimps. Diving is spectacular, layers of fish, richest coral reefs and sharks everywhere. 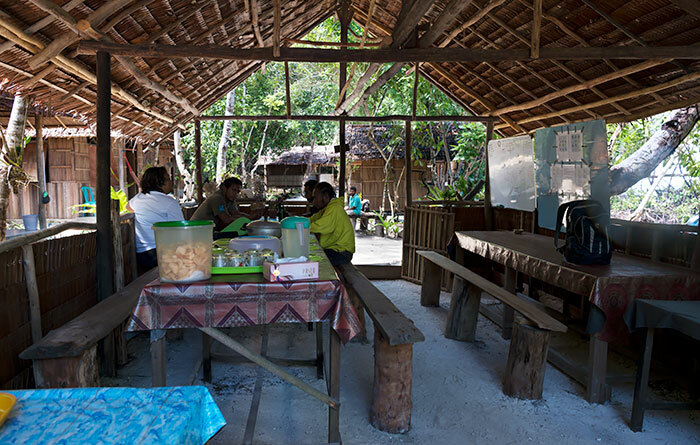 We enjoyed so much in our tours around many different villages around Raja Ampat and their jetties too. Family is extremely friendly and always helpful. It is very easy to make a deal for whatever you want. If we had some problems there are Herman and Haja which can make our wish true. Our stay at Mambrasar was really wonderful lifetime experience for all of my friends, we are all so satisfied about everything, all what we arranged was really good organized and we have only good words about our time with Mambrasar crew. Finally I finished first episode of our documentary video from our trip around Raja Ampat. First episod title is “Senang Dengan Mambrasar” and I hope you will like it. Haha! Thanks Braco. Extremely dangerous indeed! But don’t worry – hardly anybody will be able to try this at home :P You all certainly had a great time and the film is a great showreel for Mambrasar – is it OK with you if we embed it on their page? Yes of course, please embed this film into Mambrasar page. This film is our thanks to the family Mayor and to the entire Yenbuba village. Without them, our expedition would not have been so successful, casual and happy ;) We’ll be come back with another group of friends during october. Herman and his family were helpful hosts and the accommodation, view and beach were fantastic. Mind blowing sunsets. The snorkelling on the reef off the beach was amazing for sea life and beautiful coral. Saw sharks and turtles everyday! Huge variety of fish, EPIC. Food was great, good transfer service. We went diving with Dani, he hired kit on request, he was a good guide and safety conscious. Highly recommend walk up to view point , 5pm a good time to see sun setting, amazing view. Half hour walk up path behind home stay, take the left path. Thank you Herman for a great time! We spent 10 days in July. Islands are wonderful, see and beach amazing. All the staff and people were very kind with us. You don’t have to look for western standard of course, but the beauty of the place leave astonishing. Mambrasar has a very good position close to the end of the beach and very quiet. I thank all the staff and Herman who take care of us. We spent 6 days in Kri island in early May . It was an amazing experience for us. If you ‘re looking to spend a few days of peace and plenty simplicity, Kri island is the place. Mambrasar has a heavenly location , very clean rooms , they have everything you need to spend a few days off … bed , mosquito net and electricity at night. And the best part were the hosts . Herman , Haya and his family received us with great hospitality. We enjoyed its tasty lunch and dinner and share a little with family . You must do in Raja Ampat is going to Wayag per day ( tour organized Mambrasar ) to enjoy wonderful views and the best beach, and of course dive or snorkel . Grateful to Haya, herman , Sofia and the whole family ! Pasamos 6 dias en la isla Kri a principios de mayo. Fue una experiencia increíble para nosotros. Si lo que buscas es pasar unos dias de maxima paz y mucha sencillez, la isla Kri es el lugar. Mambrasar tiene una ubicación paradisiaca, las piezas muy limpias, tienen todo lo que necesitas para pasar unos días desconectado… cama, mosquitero y electricidad de noche. Y lo mejor fueron los anfitriones. Herman, Haya y su familia nos recibieron con mucha hospitalidad. Disfrutamos mucho sus ricos almuerzos y cenas, y poder compartir un poco con la familia. Un infaltable para hacer en Raja Ampat es ir a Wayag por el día (tour que organiza Mambrasar) para disfrutar de unas vistas maravillosas y la mejor playa, y por supuesto bucear o practicar snorkel. 1000% Agradecidos a Haya, herman, Sofia y toda la familia! Con mi novio estamos planeando ir a Raja Ampat, aunque nos preocupa mas que nada la cantidad de dinero a gastar. !ero que nada quería preguntar cuánto les costó en IDR la estancia por noche y cuánto cuesta ir a Wayag? I would like to thank you for the truly magically experience of staying in Raja Ampat with your hospitality and services. Mambrasar Guesthouse is an unique, rustic experience where the accommodations are very traditional housing, traditional food, and wonderful hosts and friendly locals. There’s so many memories that I will daydream about for the rest of my life. Somedays, I’m sitting at the bottom of a manta cleaning area, watching them circle around to touch the bubbles coming out of my regulator. Or sometimes, I’m back in some quiet mangrove, swimming with thousands of harmless jellyfish. There’s days where I’m sitting in my boring cubicle, doing my boring job, and I can still see all the blink green algae with the backdrop of millions of stars in the sky. The diving and snorkelling was incredible! Herman and the gang sat down with us and carefully planned out the daily trips and made sure to understand what interested us. They’re definitely shy, quiet people, but it’s understandable because of how isolated the area is. English can be a bit of an issue, but I did find that they truly cared about how happy/satisfied we were, if we had enough food, if the diving was good or not. They made every effort possible to ensure we enjoyed ourselves. Our day consisted of waking up in comfortable traditional house, having a breakfast of pancake, banana, eggs and coffee. We would load up the boat for diving, and set forth. The crew would bring lunch. We’d often sit on a quiet, white sand beach and listen to the sounds of the ocean waves. After a nice rest, it would be time to dive again! Dinner was amazing! I love fish, but I had no idea it was possible to cook it so many different ways. It was hilarious to see the guys go running out into the ocean to wave down a passing fishing boat! We ate whatever the catch of the day was, with delicious vegetables and rice. On days off of diving, we throughly enjoyed just taking a mask, fins and snorkel and putter around the shore line. We’d enjoy seeing the local sea turtles going about their business, or explore the soft coral cliffs. Sometimes, we would just sleep the afternoon away! Make sure to bring amenities you need. You can get access to the small local store, but they don’t have important things like beer or liquor :) … or you can drink the local coconut alcohol. Medicines are a must. Sand fleas can be extremely annoying and painful, make sure you bring some antibiotic cream. Also, sun screen, mosquito repellent are a must! 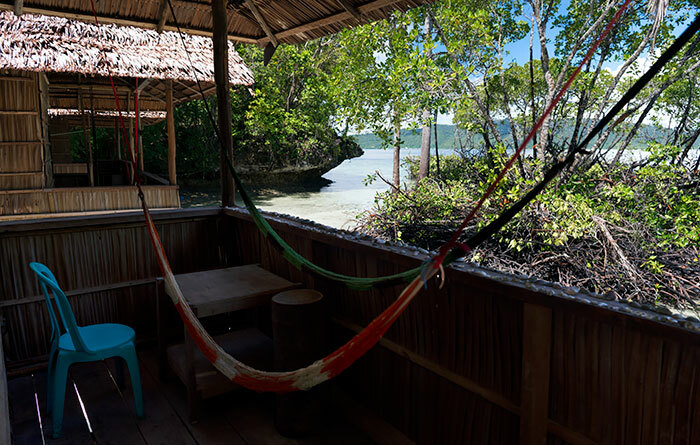 My lasting impression is that Mambrasar Guesthouse is that it’s the true Raja Ampat experience. This is a local business run by locals that benefits the community. I found that other resorts in the area are foreign owned and cater to vacationers. I’m about adventure. I don’t need internet, I don’t need cell phones or stereo systems, I don’t care what kind of toilet or shower there is (it’s western by the way). I want to experience life with the local people and experience the real culture. Thank you so much for your review. I have been trying to decide between the homestay and the ‘other’ European run resort. My main concern is of course for safety and quality of dive equipment. Did you have any concerns with that? Also did it bother you not having hot/fresh water after diving? Would return in a heartbeat! If you want to get away from it all and enjoy nature, here is the best option. We had a fantastic time while using Mambrasar as our base. Haja & Herman and their family took good care of us; showing us the most spectacular coral reefs ever; while the house reef is top notch too. Do take along some snacks/drinks along as there is only one little shop on the island. For lunch/dinner; the fresh fish and food was superb! We spent at Mambrasar for 4 nights on mid of November 2014. Pak Herman is good person and he treat our family very well. The food and the room also find. He give me a good price for the room where my 3 children take 1 room with no extra charge including the meal. Only the boat transfer pak Herman slightly pricy compare to other operator for the same distance but the diving package is at the reasonable price. Thanks pak Herman for your hospitality. We stayed at Mambrasar Guesthouse 4 nights. Our room was quite big, there was one huge bed covered with mosquito net, but no other furniture. Fortunately we had a rope with us, which we fixed along the walls, so we could hang up some of our clothes. Food was various and abundand, but breakfast was bit challenging. We especially asked about the breakfast; whether we should bring bread and eggs. We were told there is everything, we just need to bring snacks and sweet drinks, if we like. In reality we never had bread and eggs for brakfast :( There was just little piece of sweet cake and fried rice once. Do not ask them, if you like something just bring it with you. In the back yard there is a generator which is supposed to be off at 11 p.m. Unfortunatelly the generator was running until early morning hours what decreased sleep quality. The other day we went for a snorkelling trip. Hermann, the boss, was hidden all the time in his bungalow and his employee needed to run from us to him and him to us. So the negotiation was little bit difficult. We made a half day trip around the island, snorkelling was nice and even Hermann came with us as a snorkel guide, what upsed us in the morning, because nobody told us about the guide, but finally we liked the trip very much. Hermans initial transport and trips prices are slightly higher, some even double the market prices. (Maybe because he needs you to pay the petrol for whole night running genearator) Bargain, or ask in the neighbour homestays. Upon first meeting the owner of Mambrassar Homestay, Pak Hermann Mayor, we didn’t feel very welcomed. With a stony glare and not so much as a smile, we were shown our rooms, which provided little shade and little to no breeze. The main beach of Kri has a plethora of HomeStays (maybe 10 already? ), and Mambrassar was between a jetty and another stay. Our group ordered 3 rooms, and found them to be generally clean (although 1 had rat feces on the beds), but simple. The view was great (where isn’t it in Raja4?) but it felt a bit like we were cattle–herded in and out, without much interaction or care shown from the staff. The food on the other hand, at Mambrassar, is delicious! Although breakfast is minimal, the lunch and supper meals were fantastic, with more than enough to eat. Fish was always served, but since it was always prepared differently with a variety of types of fish, we enjoyed it throughout our stay. Furthermore, what Pak Herman lacked in friendliness, he made up in knowledge and care for his home. He was always careful with the reefs and he showed us some fantastic snorkeling locations. Pak Herman pointed out a vast variety of underwater life for our group, including multiple sea turtles, giant clams, huge bump heads, sharks, sea cucumbers, and much more! Overall, I would give Mambrassar Homestay a low rating, but Pak Herman’s knowledge of the area makes the stay worthwhile. Thank you for you for bringing this situation to our attention. First, I would like to apologize for any inconvenience we may have caused you. My father pak Herman meant no harm to you or any other group. He doesn’t speak English fluent and rely much to our interpreter. We have also made improvement to make sure room stay clean out of animal from the jungle. I am discouraged to hear of your negative experience. Above all else, providing excellent service is Mambrasar goal and it is unfortunate you were not treated with the respect you deserve. Given the opportunity, we would like to learn more details abour your case and to be able to make things right. Please contact us at your convenience. We spent some days in Raja Ampat and Mambrasar was a very good accomodation for us. Nice location, tasty food, basic, simple and quite accomodation, warm and kind people. Very nice and rich coral reef for snorkeling. The staff was also very kind helping us to arrange trasportation and logistics (since we spend also some days kayaking during our stay) and they also organised for us divings (Hajja was our great and very kind diving and kayaking guide). 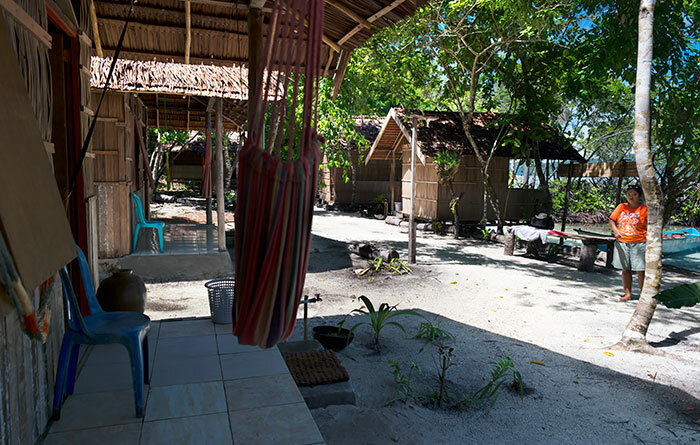 Mambrasar guesthouse is one of the few decent homestay organized by native Raja Ampat. My partner and I have a wonderful week here. The facility is quite basic but what makes it different is the place is well maintained. The shared bathroom is clean and the bungalow is cool and comfortable. The coral garden in front of the guesthouse is spectacular. Reef shark and turtle is common. We even saw a large school of bumphead some 30 of them while snorkeling in front of the guesthouse. The staffs are extremely cautious with corals well being. They will often pick the spot with less corals to drop us off which is not easy by the way…as corals hard and soft is abundant on shore. Herman and Hajja took us to spectacular sites for snorkeling every day. If you love free dive as much as we do, you would not be disappointed. These guys know all the right places! Worry not about strong currents, we just let ourselves drifted away with the current and the boat always nearby ready to get us if we need help. I still can feel and actually missed the peaceful island. I love the deserted white sand beach, the sunset, the shy but friendly fisherman that came every late afternoon to deliver fresh fish who happen to be one of the owners. 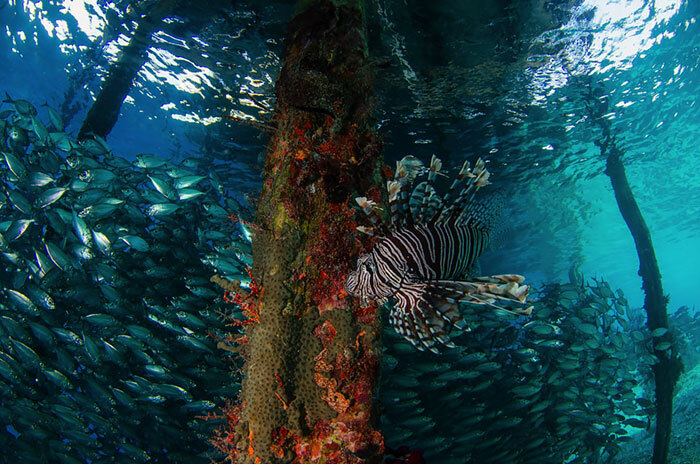 I can only say…of all the places I’ve been…Raja Ampat is the most pristine above and underwater. This place is worth to protect. If you are planning to visit, I recommend these guys. Supporting dedicated, hardworking local business such Mambrasar guesthouse is the best thing we can do. My partner and I both feel blessed, lucky and fortunate to be able to experience life in Raja Ampat.